German national final will take place in Berlin in the calendar week 8. 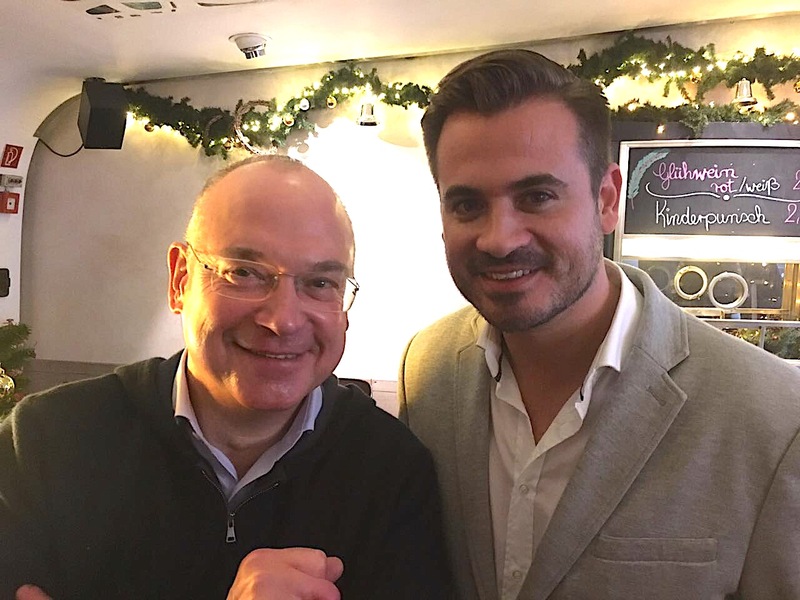 As part of the NDR Roadshow, NDR entertainment director Thomas Schreiber, the German Head of Delegation Christoph Pellender, the musical director of the Songcamp Wolfgang Dahlheimer and Eurovision jury spokeswoman Anke attended EC Germany fan meeting in Cologne, reports Prinz Blog. It was also announced that the planned Roadshow dates in Leipzig, Frankfurt and Bochum will probably not take place due to scheduling difficulties. The Hanover event, however, will go as scheduled. As part of a retrospective review of the procedure for the 2018, it was shown how very strikingly early Michael Schulte became the favorite. In all evaluation rounds of the expert jury he has occupied the first place. The song "You Let Me Walk Alone" was the outstanding favorite - both among the experts and the Eurovision jury. Interestingly, the Eurovision jury distributed slightly lower scores than the experts. Schulte then decided on the song because of the very good rating. Then the discussion went to the currently running selection. 965 candidates were considered; 400 of them had applied themselves, the rest came up with suggestions and recommendations. An internal, ten-member jury then reduced the number of applicants to 198. These then went to the juries. This year 50 members of the Eurovision jury were changed. A campaign was launched on social media that reached 1.5 million people. Of these, 12,000 have applied, of which then the 50 "Best" were chosen. Wolfgang Dahlheimer reported on the work with the artists saying that it might be an even more difficult decision for the jurors this year, as the acts are very good, but also very individual. "We are at least as well placed as last year. The base is created." Subsequently, the videos were shown, which were produced with Aly Ryan, Gregor Hägele, Makeda and submitted to the jurors. It was reported that the work in the Song Writing Camp run in different constellations from 10 in the morning until midnight at night (or longer). In the end, four songs per artist were created on average. The jurors currently have 25 songs from the camp of six artists, one of them a duet. Also included are other submissions. Two more acts are also considered. In total, more than 30 titles will be voted on. Among them are only two in German, the rest is in English. Depending on the evaluation of the two extra acts by the two juries, between six and eight acts will take part in the German preselection final. On questions of the guests present, it was confirmed that the national final will take place on week 8 in Berlin. Viewers, experts and the Eurovision jury again each make up a third of the votes. Jon Ola Sand will read the televoting points. Besides Anke, there will also be a male Eurovision jury spokesman. Today in Minsk, the Minister of Information and Communications of Kazakhstan, Dauren Abayev, met the representatives of the European Broadcasting Union, Jean Philip de Tender (Director Media) and Vannesa O'Connor (Director of Member Relations and Communications). "During the meeting, we discussed a wide range of issues, including the possibility of the Agency Khabar becoming a full Member of the Union. In addition, we agreed to work out the possibility of Kazakhstan's participation in the adult Eurovision Song Contest in the coming years," the minister said. Cypriot broadcaster CyBC categorically denied that any songwriters visited Cyprus for the Eurovision negotiations, as well as that any potential performers have been invited to listen to any songs. The statement was made by CyBC to OGAE Greece. Earlier today speaking at the "Ela, chamogela" program, singer Tamta had also denied negotiations with CyBC in regards to her possible Eurovision participation. "I'm aware that CyBC had approached Minos-EMI, my record label and among all the names my name has also been mentioned.. But my position remains the same as it was for years: I need to hear the song and like it. It will be my great honour to represent either Cyprus or Georgia or Greece, all three countries are dear to me. From Greece, no, there has been no proposal"
CyBC confirms contact with Minos-EMI, clarifying though that "exploratory talks" have been made with several record companies, but for the moment broadcaster is concentrating on the search of the perfect song for the Eurovision, and only then it will seek for the suitable performer. Dúo Dinámico, songwriters of the winning entry of the Eurovision 1968 La La La have composed a song for Noelia for the Eurovision Gala Operación Triunfo. "It is a very beautiful and surprising song because of the theme. We are admirers of women and we have always respected them very much, so the theme is feminine. We really like a girl who was expelled some weeks ago from the program called Noelia. She is a singer with a lot of strength and a huge force and that song needs someone to perform it with energy. If our song was the one selected for the contest, we would like her to perform it", noted the main precursors of pop music in Spain Manuel de la Calva and Ramón Arcusa to Las Provincias. Earlier, Noelia herself has declared her interest to perform at the Eurovision. Interestingly, when she was speaking about possibility of dueting with Famous, singer has noted: "And if I were with him, we would become a kind of Dúo Dinámico". "The Next Star" (HaKokhav HaBa) breathes life into the Israeli interest in the Eurovision Song Contest, but symbolizes the end of an era of reality shows in Israel. The show on Keshet 12 is the only one which has stable ratings, while other formats of music competitions such as "The Voice", "X Factor", "Aviv or Eyal" or the newest edition "The Four" are steadily losing viewers. The reality that transformed the old format of "Kdam Eurovision" into a high-ratings prime-time competition, succeeded last year in delivering a representative that brought Israel a victory in the Eurovision Song Contest. Maariv discussed with the Eurovision experts and fans the format of the national preselection. "The genre is clearly dying or showing signs of a very low pulse," explains Yasmin Sasson, a doctoral student in cultural sciences and a lecturer. "It is important to remember that musical reality was at its peak in Israel when there was initial enthusiasm for the format ("Wow, there are auditions, everyone can handle"). Now that there are more and more programs, it's really hard to get excited about one event". "The Next Star has got instant publicity through a nationally recognized institution," explains Tom Modan , a teacher and media researcher. "Here it worked on two levels: the technological innovation and the transparency of the selection process for the artist that represents us at the Eurovision. This has made the program more meaningful, as if we are all taking part in the national mission of winning the Eurovision, which gave the program a very deep interactivity with the viewers, and this without talking about the voting system itself and the format of the program based on the choice of the audience." "The Next Star has succeeded in revolutionizing the Eurovision Song Contest because the selection continues throughout the season," explains Guy Shachar, who manages Eurovision IL fan group. "I think that this method works because from time to time you can judge the performance of the contestants in a more thorough way, do not rely on one impression like in the previous preselection, but as viewers, we see the contestants perform different songs from different genres so that we understand better what their abilities to hold the stage, create interest and show different singing abilities"
"What used to be a niche became a big area of ​​interest because of The Next Star, which brought artists such as Netta Barzilai and Nadav Guedj," Shachar adds. "It is difficult to demand better results - an amazing win that we did not think was more possible, top 10s and finals, all this all indicates that The Next Star is a huge success, so in Malta they decided to copy the method and use their own reality to select the representative, which they have never done, and I am certain that the success of Netta and The Next Star as a platform for selecting the representative had a part in it.". "The best thing that happened because of The Next Star in recent years is that the Eurovision has returned to the public discourse and is arousing interest," explains Alon Amir, an expert on Eurovision and author of Three Minutes of Eternity. "There is, of course, Netta's victory, which is a wonderful thing, and there were also less good achievements, but this is what happens at the Eurovision - excellent achievements along with magnificent failures - The Next Star is a format that broadcasts over many months and as such, I do not like that they broadcast auditions of people who came there although they are obviously not really good enough, and will not be our next star, of course"
"Every method has pluses and minuses," says Yizhar Cohen, the first Israeli winner of the Eurovision in 1978. "The big minus of The Next Star is that experienced artists and professionals will not reach it. Maybe it is necessary to improve the program and add another track for the well-known artists who also can be chosen, and where the song will play a role in the selection of the entrant, as in the previous Eurovision selections. I am constantly asked if I will compete again at the Eurovision Song Contest. There's no telling what a day is, it's the magic of being an artist. We too surprise ourselves. What is clear is that I will not take part in The Next Star". "This is indeed a problem," Shachar says. "Veterans or familiar singers will have to compete with the new and younger generation, but in the format of The Next Star it's problematic because it's still a reality show. It's hard for me to see successful artists entering the competition"
First episode of the program will be aired today at 20:15 CET. Two new names have been added to the list of participants of Melodifestivalen 2019 according to the Aftonbladet sources: Martin Stenmarck and Liam "Liamoo" Cacatian Thomassen. Martin Stenmarck, 44, has competed three times before. In 2005, he won with "Las Vegas" and represented Sweden in the Eurovision Song Contest where the song ended in 19th place. In 2014, he returned with "När änglarna går hem" which went to Second Chance. Most recently Martin Stenmarck stood at the Melodifestivalen stage in 2016 with the song "Du tar mig tillbaks". And now, according to several well-known sources, he is ready for a fourth race. "Yes, that's a really good song," says a person with good insight. The former "Idol" winner Liam "Liamoo" Cacatian Thomassen, 21, also competes in the Melodifestivalen next year. Liamoo also competed this year with the song "Last breath", went straight to the final and finished in a sixth place. In "Idol" 2016 he stood in the final against Rebecka Karlsson so the duel can be repeated in the Melodifestivalen again. 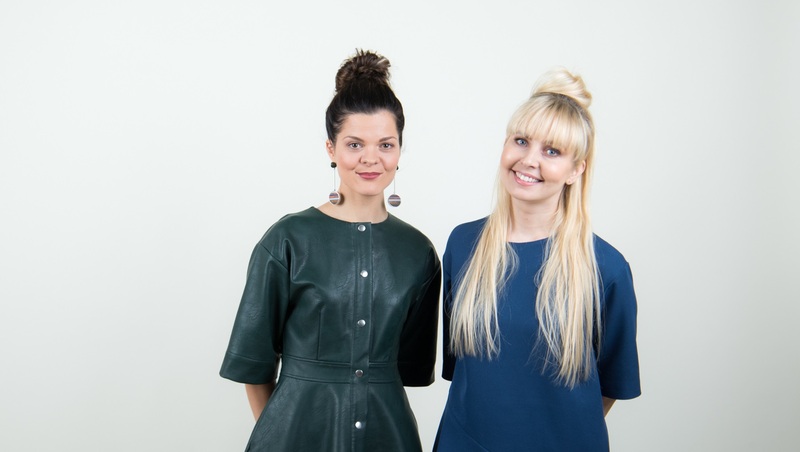 Mai Palling and Piret Järvis-Milder will host program "Eesti Laul 2019. Start", in which will be presented entries of the new seasons of the show. Recall that it will be aired on 1 December at 17:45 CET. Contract with Opatija to held Dora 2019 is nearing the conclusion. 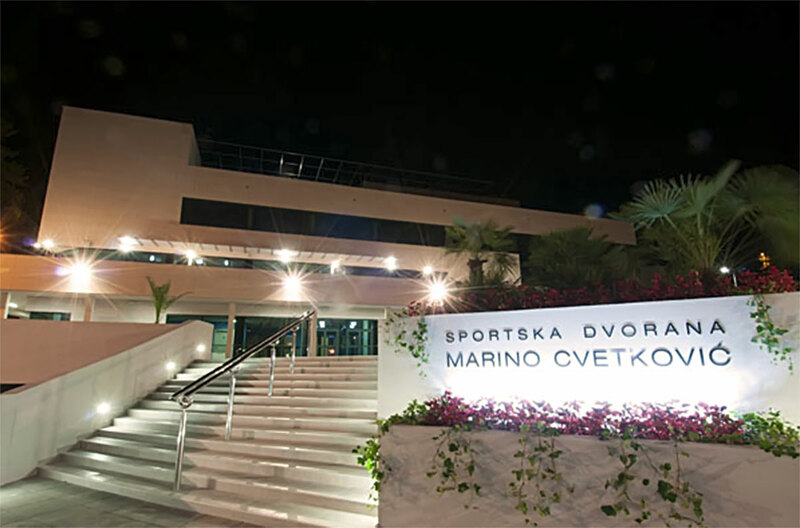 Croatian national preselection for the Eurovision 2019 Dora (named after the Croatian composer Dora Pejačević) should be held on February 16 at the Marino Cvjetković Sports Hall, as part of the Days of HRT, which will offer two more musical evenings in Opatija, one probably dedicated to Opatija's serenades and another showcasing HRT Symphony and Jazz Orchestra. "I am very pleased to say that a contract with HRT on the organization of the HRT Days in Opatija in February next year is close to be concluded. Opatija has always been the city of the festival, so I am glad that this famous music event returns home. Through the cooperation of the City of Opatija with the Opatija Festival, Opatija 21, Amadria Park Hotel, it was agreed that everyone will contribute to the HRT Days in Opatija. For now, I can confirm that the Days of HRT will be held at the Marino Cvjetković Sports Hall and at the Gervais Congress center in three evenings, the central event of which is the selection of the Croatian song for Eurosong - Dora 2019. Dora tickets for all interested citizens and guests of Opatija will be available for sale" - said Ivo Dujmić, Mayor of the City of Opatija to novilist.hr. "We expect a large number of entries from various songwriters and even foreigners, but of course the condition is that the song is performed by one of the local performers. The venue of the event, the position of the TV director and other technical conditionsare still being negotiated. I look forward to the project as well as any which carries creativity and interesting content. Music happening will last for three days, and one of those days will be reserved for the HRT Day, where we will present the HRT Symphony and Jazz Orchestra," said project manager of Dora 2019 Željen Klašterka to tportal.hr. 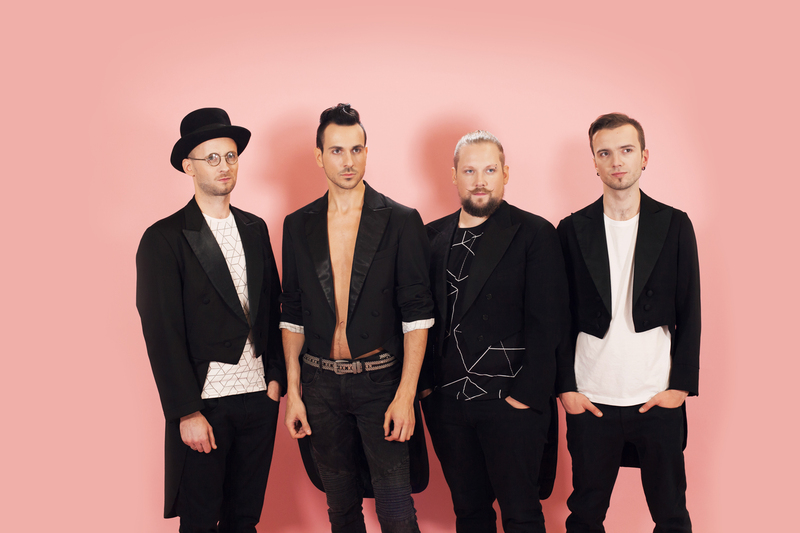 Italian chart toppers Måneskin declared their interest to compete in the Eurovision Song Contest. In the interview to Radio Italia, band member Damiano David added that he realizes that to fulfil this dream band has to win Sanremo Festival: "Then we must do it!" he says. "It would be an absolutely great experience to get to this top European stage and we would really like to be part of it, but we will think about it in a due time, we have about 50 dates to do!" It is worth to note that on the dates of Sanremo 2019 Måneskin are due to be starting their European tour which will cover whole February. In March band will continue tour in Italy, which will end on 9 April. 76 entries have been received for the Serbian preselection for the Eurovision Song Contest 2019. Deadline to submit has passed on 15 November and today all packages have been opened. RTS music editors have listened to all tracks received not knowing names of songwriters or performers since packages have been labelled only with codes. Only after the selection of the entry to the next phase the additional envelope with the name of the teams behind it will be opened. 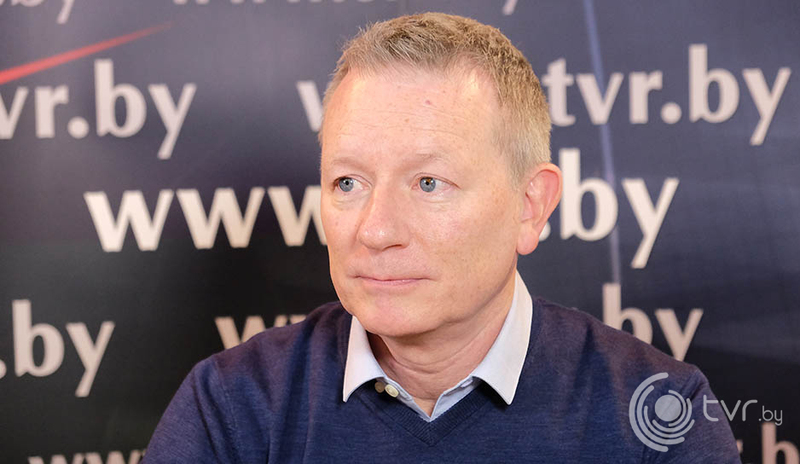 The Executive Supervisor of the Eurovision Song Contest Jon Ola Sand has clarified his statement made yesterday regarding the possibility of Kazakhstan participating in the Eurovision Song Contest 2019. "For 2019, there will be no participation for Kazakhstan at the Eurovision Song Contest. It will be discussed with Khabar Agency, the EBU and the Reference Group. It is possible to make exceptions for non-Members as Kazakhstan is, but for the time being there is no participation"
Despite the statement by Sand, it is still not excluded that Kazakhstan may be invited to the Eurovision 2019 to present a guest number. This will be necessary in order to evaluate the potential interest for the broadcast of the event in the country with the involvement of an artist from Kazakhstan in the show - after all, the contest will be broadcast in this country from 1am to 4am, and such broadcasts in previous years have brought very low TV ratings. 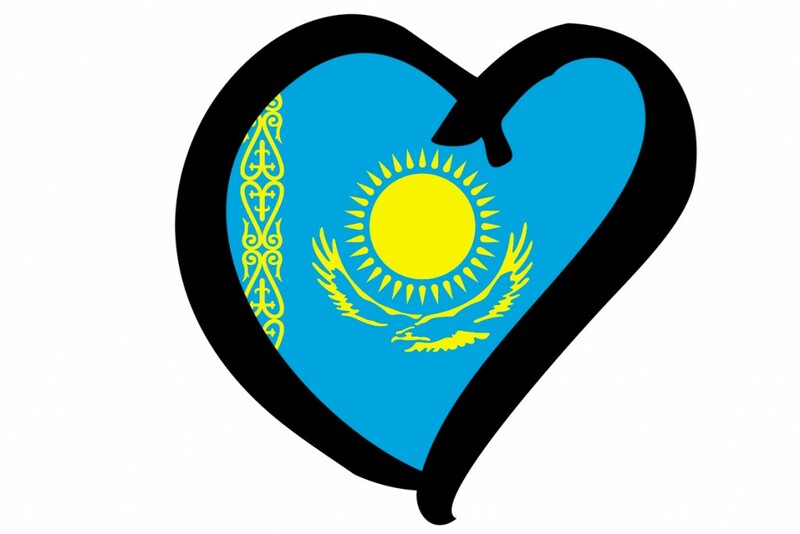 Earlier, the delegation of Kazakhstan also confirmed that it is interested to host the Junior Eurovision Song Contest 2019 in the country. "This is possible. The country in which the contest will be held next year has not yet been determined. A separate commission will decide the question, and we will also participate," said the chairman of the board of the Khabar agency, Alan Azhibayev. According to the certain information, however, the delegation of Kazakhstan proposes to move the time of the competition to October, due to the weather conditions in Astana in November. This also coincides with the plans of the EBU for the development of Eurovision Asia, which can take place next year from November 30 to December 7 in Australia. Earlier, the Eurovision Ireland website reported that for the Junior Eurovision 2019 hosting will also compete Armenia, representative of ArmTV David Tserunyan today was elected to the Reference Group of the contest. It is reported that Armenia is in favour of changing a number of contest rules, including return of the televoting procedure. At the same time, Russia, which had previously considered the possibility of organizing a contest 2019 in Sochi, stated that it will not submit an application. 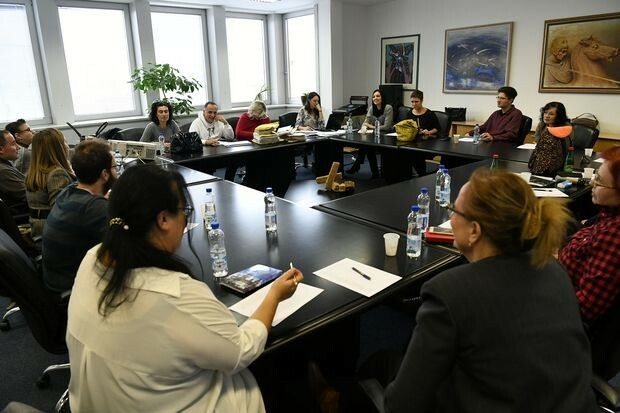 RTCG has revealed members of preselecton commission who will evaluate submitted entries and shortlist five best of them for the Montevizija participation. Mihailo Radonjić - composer, music producer and arranger. The Selection Committee was formed by the decision of the Director General of the RTCG Božidar Šundić. Submission period ends on 28 November. Public will get the opportunity to get acquainted with the selected acts through the RTCG programming prior to the national final. German broadcaster NDR returns Roadshow which will take place next week in Hannover. In the past ESC season, NDR has not only revised its ESC preselection format, but also set up the better dialogue with the fans via the Roadshow - discussion panel between organizers of the national preselection and the Eurovision fans. Roadshow starts next Tuesday, November 27, at 18:30 in Haus der Bürgerinitiative Raschplatz e.V. (Lister Meile 4, 30161 Hannover). Participants of the Roadshow will be NDR entertainment director Thomas Schreiber, Head of Delegation Christoph Pellander, Andreas Weinfurter from Simon Kucher & Partners and Werner Klötsch of digame mobile. Tomorrow, Schreiber, Pellander and Musical Director Wolfgang Dalheimer will attend EC Club Germany meeting in Cologne. 16.45: Gloria, Apostelnstraße 11, 50667 Köln, free admission. For all fans who can not come to Cologne or Hannover, there will be a Facebook live in the near future, reports Prinz Blog. In the first episode of the new season of "The Next Star for Eurovision" the religious contestant Shachar Adawi performed the song "Wikipedia" by Hanan Ben-Ari and thrilled of the judges. "I think from Netta's victory we learned that different and interesting people, and of course great singers, can do amazing work in the competition and in Israel too," mentioned Skaat. 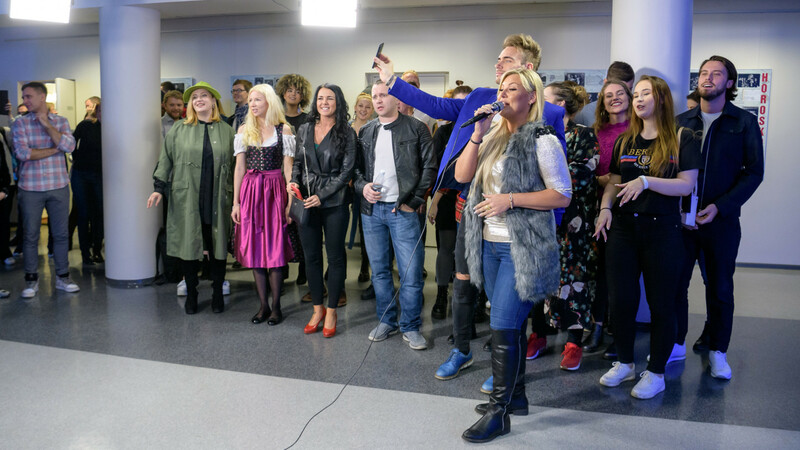 Yesterday, Latvian broadcaster LTV held second round of auditions of Supernova 2019 candidates. 33 artists and groups have attended. Among the participants were noticed Markus Riva, Miks Dukurs, Kristiāna Bumbiere, Dziļi Violets and Double Faced Eels. Names of Supernova 2019 participants will be announced on December 5, 2018. 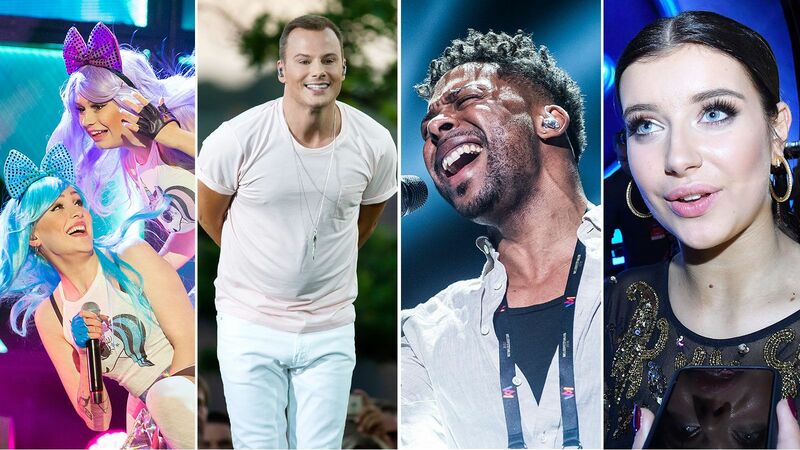 Three more names were declared by Aftonbladet newspaper ready to compete in Melodifestivalen 2019. 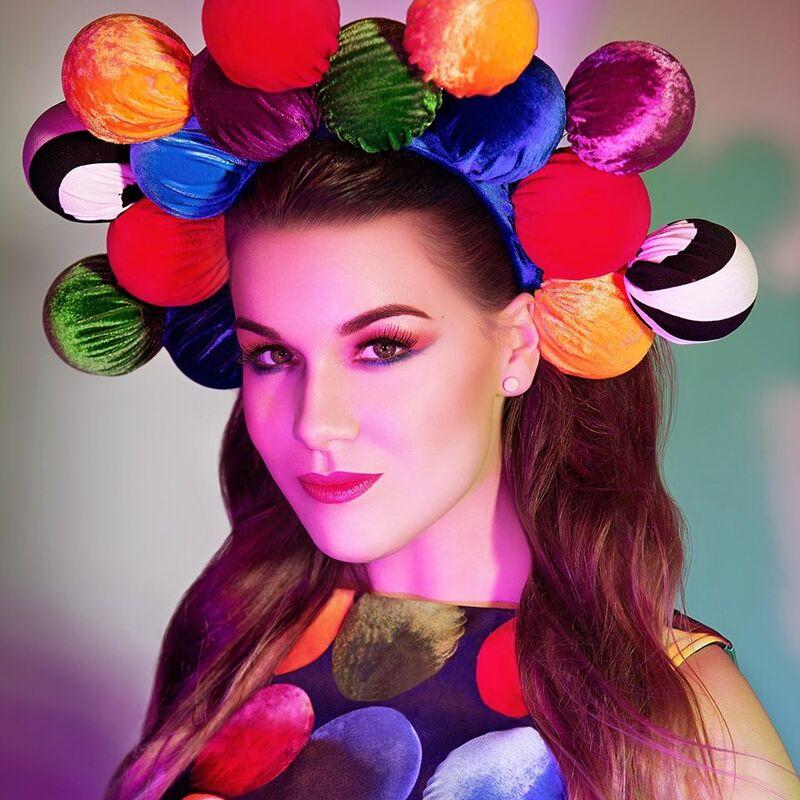 2010 winner Anna Bergendahl, 26, makes comeback in the Melodifestivalen 2019. As late as last Friday, she released song "Just another christmas". "She got quite burned after the last time, but now she feels ready. I think she's craving for revansch. And above all, it's a very strong song", says a source near the Melodifestival editorial team. Finalist of "Idol 2016" Rebecka Karlsson, 18, will also compete in the Melodifestivalen 2019. According to well-informed sources, Margaret, 27, has also got a place in next year's competition. Italian broadcaster RAI has published songs of 25 winners of academy of Area Sanremo TIM 2018. On 26 November artists will take part in the auditions for Sanremo Giovani participation. 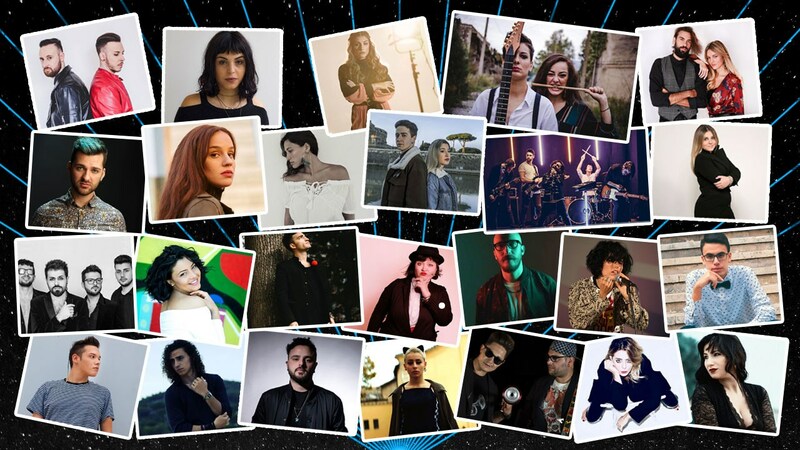 From these 25 acts and 69 acts who have auditioned on 12 November, 24 participants of Sanremo Giovani will be shortlisted. The name of finalists will be announced during a special episode of Radio2 Social Club aired on 27 November, 10:30. Guest of the program hosts Luca Barbarossa and Andrea Perroni will be Claudio Baglioni, artistic director of Sanremo festival. Listen to the songs of Area Sanremo here. Listen to previously released songs of Sanremo Giovani candidates here. Songs for the Gala 10 of Operación Triunfo 2018 have been distributed. This Gala will for the first time feature Anthem of 2018 season Somos. Marilia, recently evicted contestant of OT 2018 spoke to the press. Singer says that she considers as possible winners contestants Natalia and Famous. On the question og whether she would like to represent Spain at the Eurovision, singer noted: "Why not. It would be a matter of giving it a try". 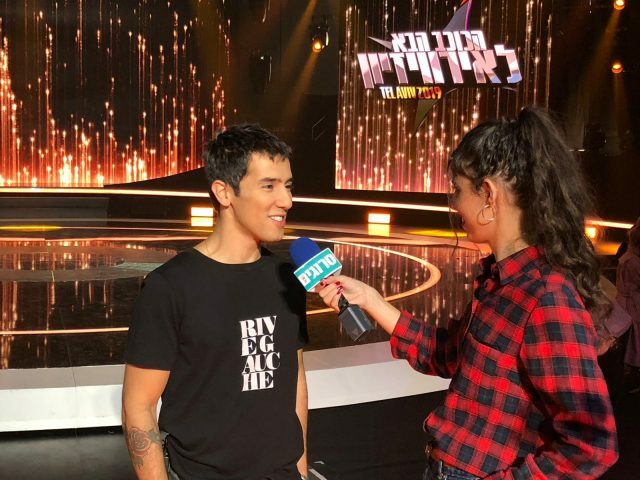 "It is mostly because I think Famous has all the necessary things to go to the Eurovision and he would do very well there, not for anything else"
Eurovison Song Contest 2010 participant and judge at "The Next Star for Eurovision", singer Harel Skaat says he hopes for another victory for Israel this year. "This year we are hosting the Eurovision Song Contest in Israel and it is very important that the local act be of Israeli character," says Harel Skaat to Srugim. "A lot of very interesting people have already attended auditions, and I've already started to mark the people I think can win at the Eurovision, I'm really counting on a double victory." According to Aftonbladet sources: Petra Marklund is dream artist for Christer Björkman in the Melodifestivalen and he keeps an open place for her in the show. In less than 5 days until presentation of the MF participating artists, few spots remain open as Christer Björkman attempts to convince some of his dream names. "After the success of "Händerna mot himlen" she has been a name that SVT and Christer Björkman often talked about. Now they feel it would be quite the right time for her to stand up", states the source. But Petra has not accepted proposal yet. According to one of the sources one of the discussions is whether Petra Marklund should appear on her own name or under her artist name "September". "She could really get an international impact and become a Eurovision winner if she sets up as September, but at the same time she has got her biggest hits in Sweden in her own name". As MF staff keeps some places open, remaining acts may receive confirmation of their participation as late as the evening before the contest. One of the artists that Aftonbladet previously reported to be ready for the competition is Magnus Carlsson, but now reliable sources say that is not the case at all. Magnus is still waiting for a message if he will have a place in the Melodifestivalen or not. Representatives of the Tel Aviv Eurovision delegation will meet at the end of the week with their counterparts in the Stockholm municipality and visit the facilities of the previous Eurovision Song Contest editions. A delegation from the Tel Aviv-Jaffa municipality went on a professional tour to the World Eurovision's capital, Stockholm, Sweden, in order to learn from the experts how to produce Eurovision properly. The representatives of the Tel Aviv delegation are city spokesman Gidi Shmerling, in his capacity as director of the Eurovision village and competition marketing director, and Eitan Schwartz, director of the Tel Aviv Global, which is responsible for absorbing the tourist river in May. This weekend, the two will meet with their counterparts in the Stockholm municipality and visit the facilities of the city that hosted the Eurovision Song Contest three times. They are expected to visit Ericsson Globen, the 16,000-seat Arena that hosted the competition in 2016, the city hall where was held the opening ceremony and the red carpet, Kungsträdgården that hosted Eurovision village, and the royal palace opposite which the Euro Club and the Euro Café were located. The Tel Aviv representatives will review logistical issues such as marketing, hospitality, transportation, mobility during the competition and more. For example, like the Globen Arena in Stockholm and the Altis Arena in Lisbon, Tel Aviv Expo also has an adjacent train station that will have to withstand unusual loads. The Swedes reached such a high level of professionalism that they last invested in the contest the lowest amount in years - less than 10 million euros, thanks to the impressive infrastructure and efficiency. They even managed to reap profits from the event - something that Israeli production can only dream about, reports Time Out. One thing Israel understands better - the field of security and cyber security. In recent years, Israeli specialists have also advised on the security issues in various Eurovision productions. "We should discuss whether we should be able to bring Kazakhstan, our Associate member in Kazakhstan, to Eurovision Song Contest, but this is part of the broader discussion that we have at EBU, so I hope I can get back with more information later"
Recall that broadcaster Khabar Agency from Kazakhstan is the Associate member of the European Broadcasting Union. According to the EBU Statute participation in the Union is divided into two categories: "Members" and "Associates". Thus, under "Members" are meant only full members of the EBU (formerly called "Active members"
Since Eurovision 2018 contest regulations introduced the term "EBU Guests": "Only television broadcasters which Members are eligible to participate in the ESC. The EBU Permanent Services may apply additional rules in order to ensure that the number of Participating Broadcasters is suitable for the format of the Shows. Subject to the approval of the Reference Group, on a year-by-year and exceptional basis, the EBU Permanent Services may invite as "guest", broadcasters located outside the EBU Territory and whose participation is deemed useful by the EBU to the ESC, to participate actively in the ESC (i.e. with a Contestant to represent their country). The EBU and the Reference Group shall have full discretion to decide on the broadcasters they wish to invite. Such invitations shall be made on a year-by-year basis and shall in no case confer on any guest broadcaster an automatic right to participate in subsequent editions". This year the songs competing in Estonian preselection Eesti Laul will be presented as videos. They can be seen during TV presentation "Eesti Laul 2019. Start" hosted by Mai Palling and Piret Järvis-Milder on 1 December 18:45 local time or on ERR website afterwards. It is not currently known whether it will be full music videos, because TV presentation program only runs for 45 minutes. On pictures: shootings of the video of Jennifer Cohen. Member of Eva+Manu duet Eva Louhivuori made a statement downplaying speculations about duo's Eurovison participation. "All right, all right. 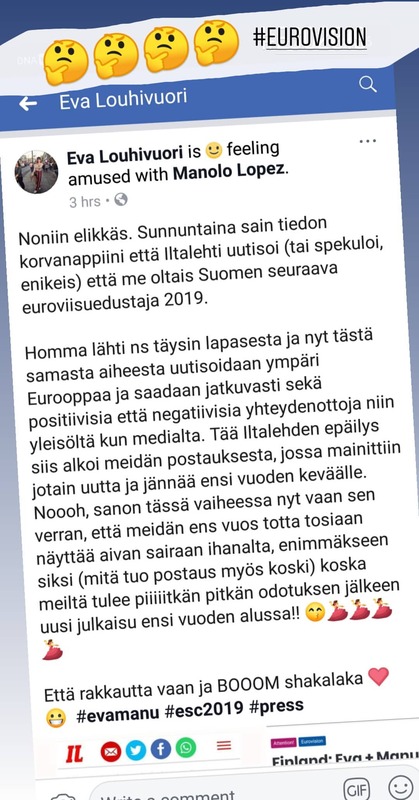 On Sunday, I got the information on my ear that the Iltalehti newspaper reported (or speculated, anyway) that we would be Finland's next next representatives at the Eurovision Song Contest 2019. It has gone completely out of hand, and now the same topic is being reported across Europe and we're constantly getting both positive and negative responses, both from the public and from the media. So this Iltalehti suspicion began with our post, which mentioned something new and exciting for next year's Spring. Well, what I can say at this point is that our next year indeed looks absolutely great, mostly for the reason (what that post also was about) that our new release after long waiting will be out at the beginning of next year!" Do you think that Eva+Manu indeed were chosen for the Eurovision? Or are they one of finalists of the national preselection? Or will they compete as songwriters? Or is this just a speculation? Marilia with 47% of the votes loses to Marta and thus leaves Academy of Operación Triunfo 2018. Miki becomes public favourite. He already was favourite in Gala 5, thus he is the first contestant who is able to become favourite for the first time. Alba Reche and Famous get to the top 3. Alba, Natalia and Sabela are saved by jury from nomination. From four nominated ones Famous is saved by Academy professors, Julia (with 3 votes) by other contestants, leaving María (2 votes) and Marta (no votes) nominated for the eviction in the next program. Two well-known Lithuanian performers declared Eurovision interest. Paola Hart (Paulina Paulauskaitė) won the third place in the "X Factor" in 2017 and was named as one of the most voted performers in the project. Also in the same year, she became the fifth best performer in the "Slavianskij Bazar" competition. She has recetly released her first Lithuanian language single "Liksiu čia"
Paola, who is studying at the Royal Conservatoire of Scotland, will be in Lithuania at the beginning of December and thinks of taking the opportunity to participate in the Eurovision: "I have a lot of future plans: I think about participation in the Lithuanian Eurovision preselection as well as about the creation of my own business, which of course will be related to the music - a children's singing studio", singer says to TV3. Band The Roop has recently returned from San Francisco, and leader of the band Vaidotas Valiukevičius, lived and worked for a month on the island of Fuerteventura, near the shores of Africa. Celebrating the fourth birthday together the band is considering their Eurovision return. Band has even conducted a poll on their social netwok page where people responded: "Yes, it is worth taking part". <"We will not hide, it is really nice to receive such support. If we will apply, we can not answer yet. We are just talking and thinking on this right now. It's still a bit of a while until the end of the submission period. But yes, there is a good chance that we will listen to people", Vaidotas said to Zmones. Submission deadline in Lithuania is set for 10 December. Head of Entertainment of Austrian broadcaster ORF Edgar Böhm retires at the end of the year. He has not only been responsible for various show formats such as "Starmania" and "Dancing Stars" since 1999, but was also responsible for the children's programming, cabaret & comedy, Opernball & Life Ball and was the executive producer of the Eurovision 2015. One of the last tasks of Böhm will be to decide on the Austrian representation in the Eurovision Song Contest 2019. 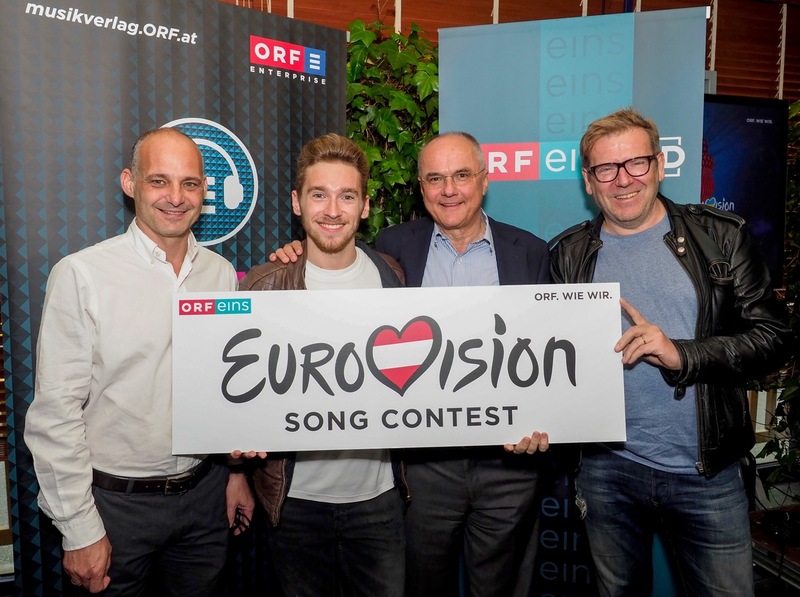 As usual, ORF has commissioned Ö3 veteran Eberhard Forcher, who had once again reached out and presented Böhm with a handful of potential ESC candidates for Israel. The internal decision should be made in December; and according to Kleine Zeitung publication it may well be a power ballad or a dynamic pop duo song. Greek broadcaster Star TV reports that Cypriot broadcaster RIK has requested appointment with Tamta to listen to the songs they have on offer for the Eurovision 2019 participation. This report contradicts with previous report of Alpha TV stating that the Eurovision entry for Cyprus has been already recorded. 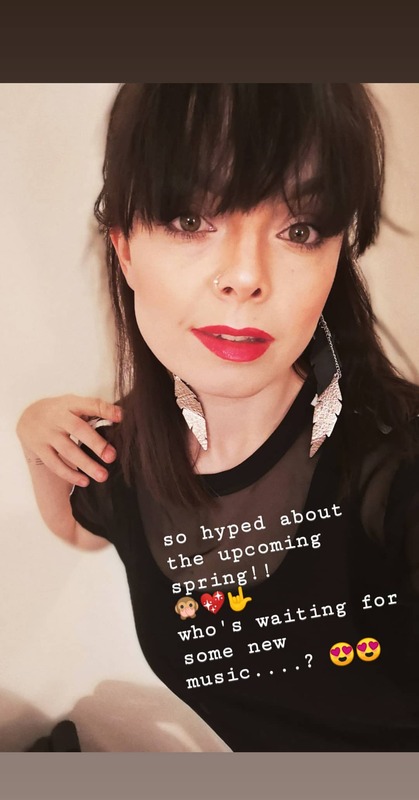 Eurovision Fun reports that besides Alex Papaconstantinou, who is expected to arrive to Cyprus shortly, entry has been received from Swedish composer Linnea Deb. It is believed that RIK has on offer at least four potential songs from well-known songwriters. Officially, broadcaster states that despite rumours about various artists like Tamta, Vangelis Kakourgiotis and others, RIK is currently focusing on completing the process that prepares the song that will represent Cyprus. Broadcaster has made exploratory contacts with various record companies so that it has a variety of choices depending on the song that will be chosen. A new name is added in the rumours for Greece representation: People Greece writes that Nikos Ganos had an appointment with ERT officials. Singer does not confirm this information, but stresses that it would be a great joy to take part in the Song Contest. In other news, Greek singer Elpida has revealed she will be going to Tel Aviv form the big event Israel is planning within the framework of the Eurovision Song Contest and for which numerous former entrants have been invited. She will perform her 1979 entry Socrates with the Tel Aviv Symphony Orchestra. Additional information: Cyprus page, Greece page. Official presentation of the participants of the festival will take place on 27 November. Dolly Style have devoted much of the Autumn to test different songs for the Melodifestival and have now got a place in the competition. Dolly Style debuted in the Melodifestivalen 2015 and then competed again the following year. Since then all members of the group have been replaced. As late as this Monday, the group has announced on Instagram that one of them chose to move on and that they would soon be presenting a new "Polly". Hanna Ferm, 18, competed in "Idol" 2017 and finished second. Last Friday she showed up again in TV4's talent hunt when she sang duet with one of this year's participant, Bragi Bergsson. Previously, it already was reported that Magnus Carlsson, 44, and John Lundvik, 35, have been considered for the Melodifestivalen, and SVT was keen to bring them to the competition but that they were still looking for songs. Now sources say that both managed to find right songs and will compete in the festival. From the list of likely, but not yet confirmed participants remains only Margaret. The Eurovision Song Contest in Israel is on track to skip over the last obstacle: IPBC is expected to agree to the terms of loan that the Ministry of Finance will allocate for the contest. However, the decision is not final yet. The board of directors of the IPBC has instructed the management to examine with the Ministry of Finance the terms of the loan that will enable the production of the Eurovision Song Contest. The directive came despite the board's explanations that allocating NIS 110 million (26 mln EUR) of the corporation's budget to finance the event poses great difficulties, possibly harming local productions, creative artists and employees. However, the board members stated that they "believe that holding the contest in Israel is of great importance to the image and economy of the country – and therefore agreed to undertake an examination of the terms of the loan with the intention of holding the competition, as long as they don't impinge on fulfilling the corporation’s mandate, as stipulated by law." The issue of budgeting of the Eurovision by the state rose to the meeting of the corporation's board after the storm that arose following the government's decision to grant required financing only as a loan. Based on the draft submitted to the European Broadcasting Union, the competition budget is estimated at NIS 157 million (37 mln EUR), with revenues from ticket sales, sponsorship and EBU participation fees being at NIS 40 million. To date, the Ministry of Finance has agreed to grant a loan of NIS 70 million, while IPBC made it clear that the required budget is NIS 110 million. Alongside these, the State of Israel is expected to benefit from the tourists who will be flooding Tel Aviv in anticipation of the competition as well as from a huge stage to improve Israel's image abroad. The corporation's annual budget is NIS 650 million, which means that if it is forced to finance the competition from its pocket, the original productions will have to absorb the blow. The decision has been taken despite strong advice of IPBC CEO Eldad Koblenz to reject the loan. "The law requires the corporation to invest and nurture Israeli creativity and the local production market. The loan will damage Israeli creators and works, so I would recommend to the board not to accept the outline of the loan for the Eurovision Song Contest", he stated yesterday. During the turbulent months since the victory of Netta Barzilai, Koblenz made it clear - he does not want IPBC to finance the event, event as the cost of cancelling organization in Israel. At the same time, Government officials sent a message to Gil Omer, the chairman of the board, and the company's CEO, Koblenz, that if the Eurovision Song Contest does not eventually take place in Israel due to the various budget disputes, they would shut down the broadcaster. In this case, IPBC will also lose 12 mln EUR of the financial guarantee which broadcaster has already taken on the conditions of the loan - they will be transferred to the new host broadcaster. The decision was made by a majority of seven, while two opposed - among them Koblenz (who is not a board member). In the coming days, the corporation and the Finance Ministry will discuss the amount of the loan and the terms of return in the coming years. The decision leaves the Corporation and the government with room to maneuver on the issue of budgeting the Eurovision Song Contest, when both sides can still get off the tree they have climbed on or reach a compromise that will allow contest in Israel to take place. A final decision regarding the future of the event will be made only at a later date. 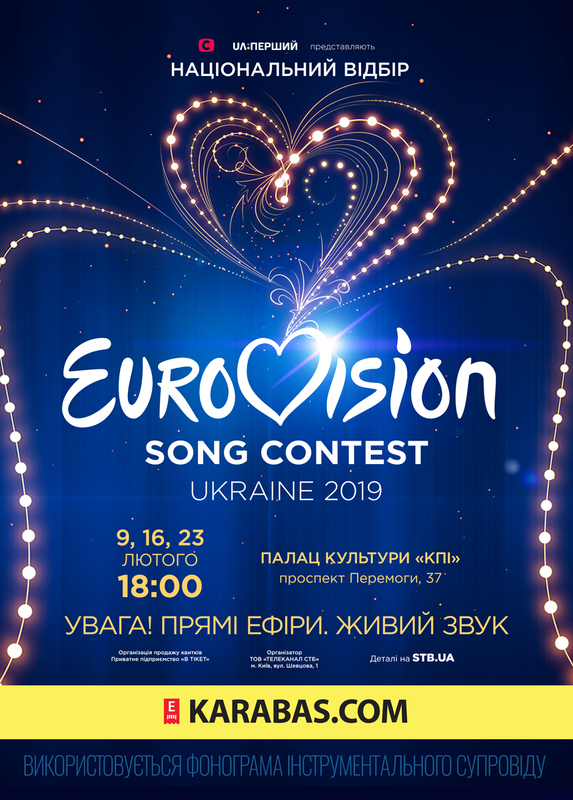 Tickets for the semifinals of the national Ukrainian preselection for the Eurovision 2019, scheduled for February 9 and 16, are on sale. One can purchase them at karabas.com or concert.ua. 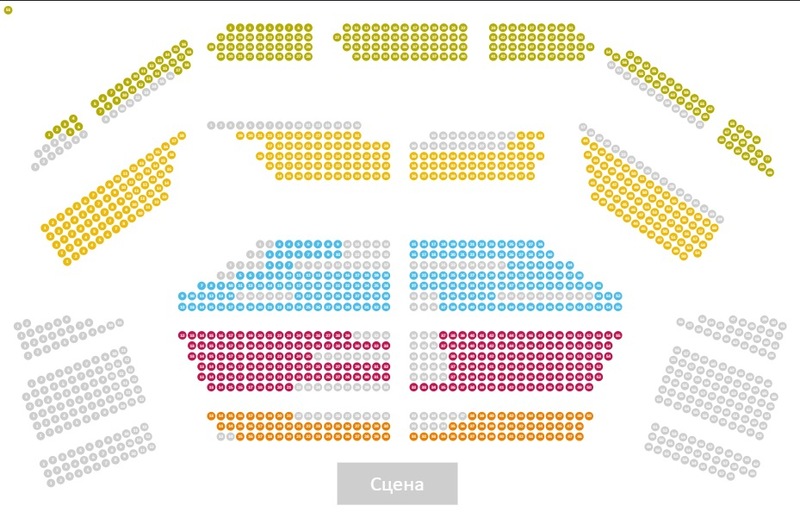 Ticket price: 320 - 1090 UAH. Tickets for the final show will go on sale in January. Address: Palace of Culture KPI (Kyiv, Victory Avenue, 37). The live broadcast of the National Selection 2019 will be carried out simultaneously on STB and UA:Pershiy TV channels on 9, 16 and 23 February (beginning at 19:00 local time). TV channels STB and UA:Pershiy again united to host the National selection for the Eurovision 2019 for the fourth time. Join to be in the very center of a large-scale competition, which the whole country will be talking about. Feel the incredible energy of the hall and the emotions of the participants. Choose an artist who will represent Ukraine at the Eurovision Song Contest 2019 in Israel. Get a unique opportunity to personally see everything the most interesting - what is usually left behind a television broadcast. Israeli Public Broadcasting Corporation is expected to produce a new comedy series that will present an attempt by Daesh to carry out a terrorist attach on the Eurovision Song Contest, reports Walla. The Israeli broadcasting corporation KAN, which is responsible for producing the Eurovision Song Contest 2019, is expected to produce a new comic series that will deal with a French Muslim singer Gay Baron sent to the Eurovision, was suspected by the Mossad of being a terrorist and extorted by Daesh. A comic mini-series will be called "Duz Pua" (temporary name) and is being considered to be broadcast in Spring before the Eurovision Song Contest in Israel. 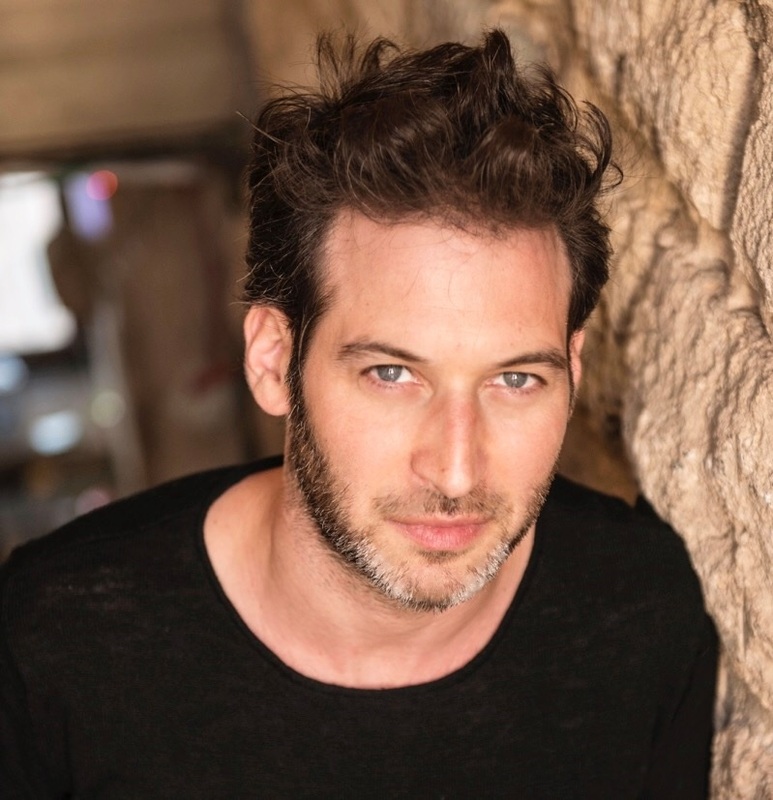 The series is still "in its infancy" and is currently in the stage of selection of the Israeli and French actors. The shooting is expected to begin in January. 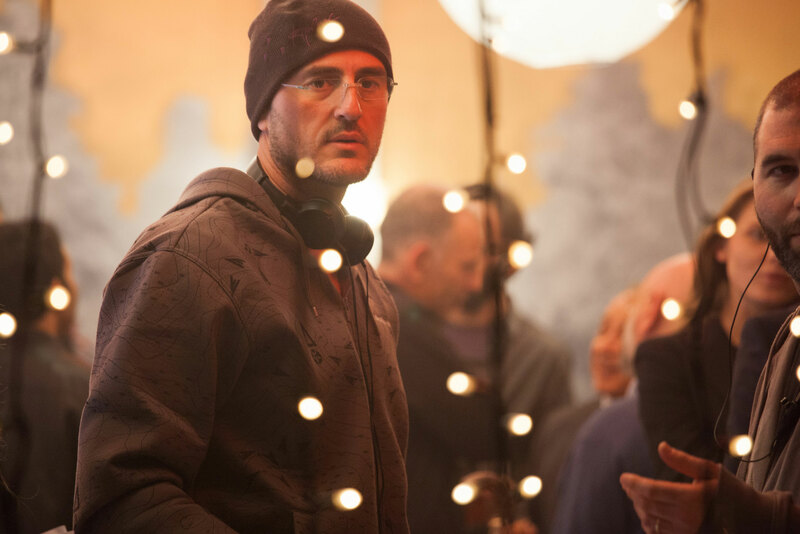 The person who was chosen to direct and edit the series is Dani Sirkin (who worked on Noa Yedlin's "Stockholm" this year). In 2003 he was involved in the award-winning television film "Hallelujah", a comedy that takes place against the background of the Eurovision Song Contest in Israel in 1979. Croatian broadcaster HRT has released regulations for the national preselection DORA 2019. Dora will consist of one evening which will be broadcast live on HRT in February 2019. Submission period is open from 20 November to 10 January. Only songs that were not presented to the public before can compete. Lyrics should be written in one of four languages: Croatia, English, French and Italian. Performers should be nationals of Croatia over 16 years old on the date of entry submission. Entries should be sent to Hrvatska radiotelevizija, Prisavlje 3, 10000 Zagreb, with the mention "Za javni natječaj - DORA 2019" or can be submitted online. 16 participants and 2 back-ups will be chosen from the list of submissions by the professional jury which will include representatives of HGU (Croatian Musicians Union), HDS (Croatian Society of Composers) and HRT, music critics, singers with experience on Eurovision, composers and songwriters selected by HRT. They will be guided exclusively by the artistic value with emphasis on the quality of music and lyrics and the entire work. HRT reserves the right to determine the order of the performances of DORA. During the live broadast the best song will be chosen by the means of televoting and jury vote. Detailed voting regulations will be published no later than 31 January. Home-renting company Airbnb has decided to remove all listings in Jewish settlements in the occupied West Bank, enclaves that most world powers consider illegal for taking up land where Palestinians seek statehood. "We concluded that we should remove listings in Israeli settlements in the occupied West Bank that are at the core of the dispute between Israelis and Palestinians," a statement on the Airbnb website said. "Our hope is that someday sooner rather than later, a framework is put in place where the entire global community is aligned so there will be a resolution to this historic conflict and a clear path forward for everybody to follow." An Airbnb spokesman said the decision, affecting some 200 listings, would take effect in the days ahead. Yariv Levin, Minister of Tourism had announced that he began to formulate immediate steps to restrict the company's activity throughout the country. He strongly demanded that the Airbnb administration cancels the discriminatory decision stressing that this it a disgraceful and miserable. "If you have a policy of discrimination against Israelis you cannot earn money in Israel," he told The Associated Press. He also said the government would encourage hosts in West Bank settlements to sue the company to make it "pay" for its decision. Levin added that Israel would impose other restrictions on Airbnb's operations in the country, without elaborating. At the same time, Levin instructed his ministry's management to implement a special program to encourage tourism and accommodation in vacation apartments throughout Judea and Samaria. There is no immediate information which kind of restrictions may be applied and if they can affect accomodation during the Eurovision Song Contest. Winner of the 69th Sanremo Festival of the Italian Song will again be the first option to represent Italy at the Eurovision Song Contest 2019. Today RAI has published rulebook of the Festival. If the above mentioned artist does not intend to make use of this option, RAI reserves the right to choose the participant according to its own criteria. As reported earlier, Sanremo 2019 will take place on 5-9 February in the Ariston Theater of Sanremo. 24 artists will be competing in the festival. For the composition of the line-up of the participating artists Artistic Director of the event Claudio Baglioni and Directorate of Rai Uno will be able to use the help of the Music Commission according to criteria that will hold account of the quality and originality of the songs, as well as the interpretation and requirements of contemporaneity, fame and recognized value of the performers. Two places will be reserved for the winners of Sanremo Giovani competition, who will have to present a new song. All the songs in the competition must have the following requisites: the lyrics must be in Italian, though short phrases in other languages are allowed; songs have to be new at the moment of submission and remain so until the first performance at the Festival; Duration of the songs should not exceed four minutes. Deadline to apply for the participation in the festival is 7 December 2018. Entries have to be sent to RAI - Organization of the Festival, via Montesanto 68, 00195 Rome. The entry should indicate proposed guest artist for the fourth evening. The chosen artists will be announced by RAI by Saturday, December 22 - most likely during Sanremo Giovani broadcast. On the first evening all songs will be presented, and a three tier voting held: Public televoting (40%), Demoscopica Jury (30%), Press Room Jury (30%). On the second and third evening 12 of the songs will be presented, and same three tier voting used. Fourth evening will be a duet night, when participants will perform their entries with a help of the guest artists, identified in agreement with Artistic Director and Rai Uno. Voting will be done by Televoting (50%), Press Room Jury (30%) and Experts Jury (20%). The ranking will be added to the ranking of the previous three days, also Rai Uno reserves the right to assign a special prize for the most voted guest of the evening. On fifth and final evening, all 24 songs will be performed again, voted by Televoting (50%), Press Room Jury (30%) and Experts Jury (20%). All days combined rating will be calculated and three best songs will qualify to the Superfinal. They will be performed again and the same voting system used to determine the winner. Carlos Jean withdrew his "canción perfecta" to make changes after the criticism received. "I'm going to make a couple of changes, that because of the rush there's something that I'm not fond in the perfect song," the composer confessed through his Twitter account. "Do not make blood," the musician asked through the same social network, before stating that he would make some changes, "since we are in a democratic process." "Although what mattered for the composition was the melody and the lyrics, we are going to try to change some things," Jean said through a video posted on his YouTube account explaining his decision to give a twist to the song. "With the melodies you have sent, I've tried to do it as best as possible. The idea was to get the perfect song for the Eurovision done by people, and this is an experiment, that can go well, or not," clarified the musician. "It would have been even better to have more proposals rather than criticism," said Jean, who claimed that he had received very few collaborations compared to the other projects. ERR has held today official presentation of the artists, taking part in Eesti Laul 2019. The split of the semifinals of the event was revealed as well. 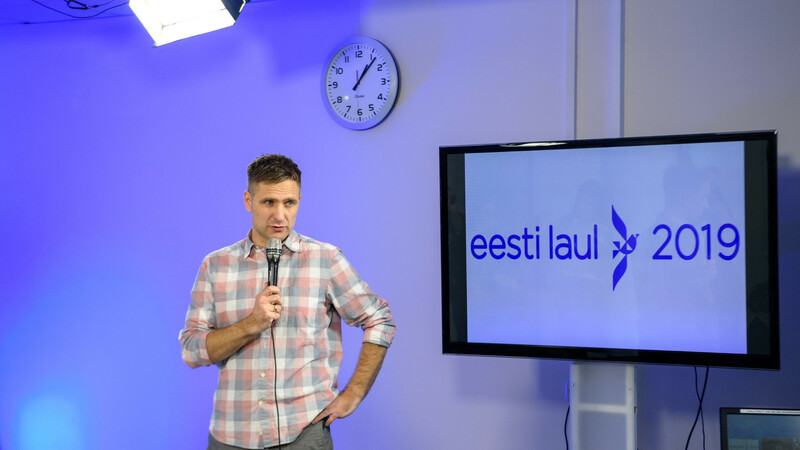 Speaking earlier to Raadio 2, new Eesti Laul boss Tomi Rahula described the changes in the contest and discussed formation of the preselection jury. "The goals of the new Eesti Laul are to carry forward the old traditions, to simply upgrade and update things," says Rahula. One of the changes was to make semifinals live. "The tension is even bigger for the competitors, it's like the Eurovision, you do not have multiple chances, it's live broadcast and the people will vote on that basis," Rahula explained. In addition, Rahula wants to improve the quality of the music with his changes. "To make music writers more motivated and to increase their level. Similarly, in the TV picture, the level will go up as well. We will bring in tiny updates - mappings and things that have not yet been used," said Rahula, adding that projections will be introduced in the television picture. Rahula agrees that the drop in the number of submitted entries was due to the introduction of the participation fee, but says: "I think that certainly some tracks were not sent in because people thought if it is a kind of joke then why should they waste their money. Despite the fee, the participation still was very large, which is very good. I've heard the songs and it is clear that people thought before submitting their entries. There were a couple of pearls inside as well. In the majority, it's still a foreign pop, poprock. Unfortunately it is clear that songs in English have been better produced and on average of better quality than of songs in Estonian". The new rule is that the songs submitted to the competition must not be made public until December 4. "My wish was for all the artists to have an equal start," Rahula said. "When we give a start, everyone will have the opportunity to hype their entries", he added. In the preselection jury was included only one representative of ERR. Rahula does not think that the private media has hijacked Eesti Laul. "I have the pleasure of having a private media or someone else's media. It's important that the jury I have put together is competent, whom I trust," Rahula explained. The disputed issue was inclusion of Karl-Erik Taukar, whose partner Kerli Kivilaan is taking part in the contest. According to Rahula, such situations were there before. "When I asked Taukar if he would agree to participate in the preselection jury, he immediately said that Kerli would take part. I said that there was no difference, let's take it". According to Rahula, there were also members in this jury who had close friends among the singers. "It was nicely said to the jury that they should not give their loved ones marks, there were some who left some entries without evaluating, so they had some connection, it was very honest, and I do not doubt the people I dared to choose," said Rahula. Johanna Eendra	- Miks sa teed nii? According to the report of Me Agapi Christiana program on ALPHA TV Cyprus, the song which will represent Cyprus at the Eurovision 2019 has already been recorded. Commenting on the song, the show panel informed that it is a very nice song, even better than Fuego. The show did not reveal the artist who is performing the song, but all sources point that this can be Tamta. Eurovision Fun website reports that on Thursday 22 November songwriter Alex Papaconstantinou will travel to Cyprus accompanied by Christer Björkman, to sort out the latest details. Tal Forer has been appointed as music producer and arranger of the Eurovision Song Contest 2019, reports Walla. Forer will work on theme music of the event and also postcard music. 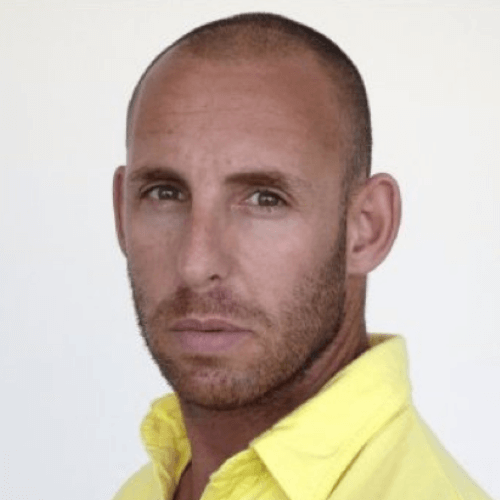 Producer, arranger, composer and pianist Tal Forer, 40, is one of the most active and prominent musicians in Israel. Among other things, he has been a musical producer of "The Voice" since its first season. He worked with such artists as Shlomo Artzi, Shlomi Shabat, Harel Skaat, Sarit Hadad, Eyal Golan and others. 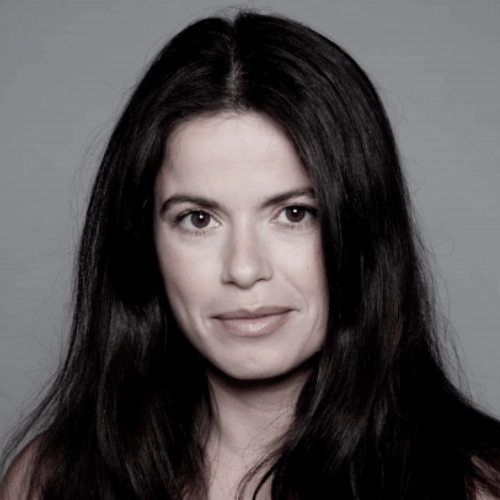 Director Keren Hochma (who was behind music video for "Toy") and art director Shmuel Ben Shalom were appointed as responsible for the production of the postards. Production company for postcards will be chosen shortly on special tender launched by KAN. Walla reports that 42 representatives of the countries will arrive in Israel for the filming of the postcards in April, and due to time constraints will be met simultaneously by a number of directors, coordinated by Hochma and Ben Shalom. An acclaimed and internationally celebrated choreographer in her past, Karen Hochma first took on directing making music videos and today, she is one of the leading commercial, TV and music directors in Israel. She is the proud recipient of an MTV International Award and 3 Israeli TV Academy Awards. Her work is highly visual and sensorial, drawing influences from her background in dance to create a unique physical and rhythmical language. Ben Shalom is an art director working in commercials, TV and film. He is the owner of OCD, a company specializing in architecture and industrial design. He was head of the graphics department on the production of the American film The Insider and a set decorator on Spy Games. His works have been showcased in design and art exhibitions around the world. Eva & Manu is the fresh name in the list of rumours about possible representative of Finland at the Eurovision Song Contest 2019. Popular performers have stated on their Facebook page: "Already looking towards Spring 2019 becaaaause... 🎶🙊💖 #evamanu #comingup"
"Our future looks great but can't reveal any details yet. New album coming out tho early 2019 that we can say"
Also duet has published in their Instagram stories screenshot of Italehti publication, where they are named as possible Eurovision participants and photo of the ESC 2006 winners Lordi. Duet of Eva Louhivuori from Jyväskylä and Emmanuel "Manu" Laudic from Paris has released two albums: Eva & Manu (2012) and Cinnamon Hearts (2014), which have charted in the national top 10. Bootcamp stage has been completed in the X Factor Malta. After Wall of Songs 47 performers remain in the race, inlcuding 8 newly formed bands. Groups (10) (Alexandra Alden): Kayati, Clelis, 4th Line (Anthea Bezzina, Nicole Falzon, Milena Bianco, Miriana Conte), Extreme (Nicole Azzopardi, Elishia Semaan, Martha Micallef Attard, Lindsay Pace), Systm 12 (Kyle Cutajar, Dario Mifsud Bonnici, Josef Tabone), Sudden Crown (Stefan Galea, Mikhail Attard, Ryan Grech, Clayton Portelli), Horizon (Kurt Anthony, Matthew Grech), Lorelai (Gabrielle Portelli, Cynthia Zaffarese), Prism (Denise Mercieca, Sarah Bonnici, Martina Micallef, Aaliyah Mallia), Radiate (Raquel Seguna, Rachel Mamo, G.O.L.D). Boys (11) (Ira Losco): Aleandro Pace Tahir, Owen Leuellen, Isaac Mercieca, Aidan Cassar, Norbert Bondin, Mark Anthony Bartolo, Claudio Zammit, Miguel Bonello, James Mifsud, Luke Chappell, Matthew Anthony Caruana. Girls (14) (Howard Keith): Kelsey Bellante, Raisa Marie Micallef, Michela Galea, Victoria Sciberras, Nicole Frendo, Karin Duff, Shauna Vassallo, Jade Vella, Nicole Brincat, Kaylie Magri, Gail Attard, Kelly Moncado, Danica Muscat, Michela Pace. Overs (12) (Ray Mercieca): Kim Cortis, Janice Debattista, Janice Mangion, Franklin Calleja, Vanessa Sultana, Anna Azzopardi, Laura Bruno, Chris Grech, Anna Faniello, Rachel Tedesco Triccas, Ben Purplle, Petra. It is worth to mention that Nicole Hammett, who originally got invitation to become member of Extreme group, was withdrawn from the further participation by her parents and replaced by Lindsay Pace and Martha Micallef Attard. Next stage will be the Six Chair Challenge. Financing of the Eurovision 2019 was again in doubt due to the intervention attempts of various Israeli politicians. Today, the Government of Israel was debating the cuts to the state budget. The Treasury sought to cut NIS 22 billion from government ministries over the next 20 years (until 2038). Most of the money will fund additional pay for police officers and prison guards, but some of it will also go toward funding aid for the Israeli communities on the Gaza border, hiring additional construction inspectors, and hosting the Eurovision Song Content. A number of ministers have opposed the proposal, and especially fiercely against the intention to allocate money from the stage budget to finance the Eurovision contest. The Minister of Internal Affairs of Israel Aryeh Deri, said: "I, along with Minister of Culture Miri Regev, of Construction Uri Ariel and other ministers, opposed to giving additional budgets to the IPBC to produce the Eurovision. I opposed it because of the expected mass desecration of the Shabbat, while other ministers opposed it because they believe the IPBC needs to fund the Eurovision's production out of its large budget, without receiving additional funds." Culture and Sports Minister Miri Regev also objected to funding the Eurovision from the budget of her ministry and demanded that the corporation itself finance the events from its NIS 800 million budget. "I'll fight for it," shouted Regev. Regev's position that the corporation itself should finance the Eurovision Song Contest is contrary to Regev's own declarations, immediately after the the victory. In those statements, Regev argued that a budget source should be found from government ministries. 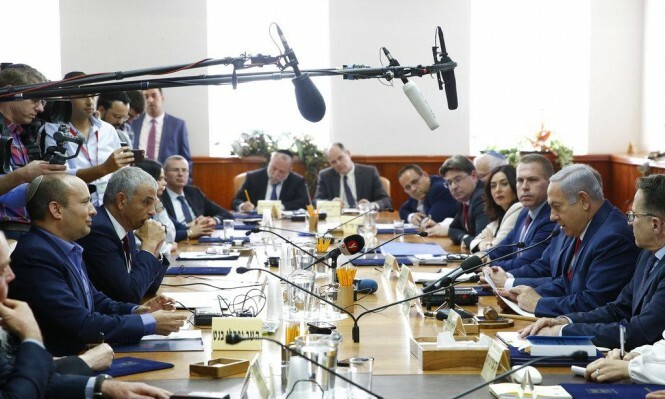 However, when it was decided that the ministers would not have any involvement in the events, Regev objects to the funding from her ministry's budget. In the end, however, the decision was nevertheless accepted because it was carried out in one package, and the ministers could not vote directly against the Eurovision financing. Now the Broadcasting Corporation must submit the budget of the contest (approximately NIS 150 million - EUR 35 million) to the EBU in late November or early December. KAN undertook to finance NIS 40 million from sponsorship and EBU participating fees, while the remaining NIS 110 million was to be transferred by the Ministry of Finance. However, currently, the budget for the Eurovision approved by the government is defined as the loan only - which means the Corporation will have to cut back to return. The Ministry of Communications will have to pass a legislative amendment to the Public Broadcasting Corporation Law, which will allow the budget to be transferred to the corporation for the benefit of the Eurovision Song Contest. In order to change the situation, a Knesset plenum should be convened and reform, for the tenth time, the Public Broadcasting Corporation Law - this time in order to enable the Eurovision Song Contest to be held in Israel. However, such a legislative change is unlikely to happen in the current political climate - which may bring another serious crisis to the financing of the contest. As the chairman of the IPBC Gil Omer warned in August, without any help from the government, the corporation will be forced to cancel the Eurovision Song Contest, which will also result in a loss of the EUR 12 million guarantee that corporation took upon itself at the expense of the 2019 budget. Финал немецкого национального отбора пройдет в Берлине на 8й календарной неделе 2019 года. В рамках Roadshow, директор отдела развлекательных программ NDR Томас Шрайбер, глава делегации Германии Кристоф Пелландер, музыкальный директор авторского лагеря Вольфганг Дальхеймер и глашатай жюри Евровидения Анке посетили встречу фан-клуба EC Germany в Кельне, пишет Prinz Blog. Также было объявлено, что ранее планируемое Roadshow в Лейпциге, Франкфурте и Бохуме скорее всего не состоится из-за плотности графика его участников. Но мероприятие в Ганновере пройдет по графику. Была показана ретроспектива отбора 2018 года, и стало известно как потрясающе рано Михаэль Шульте стал фаворитом отбора. Во всех раундах голосования экспертного жюри он занял 1е место. Песня "You Let Me Walk Alone" также стала фаворитом - как среди экспертов, так и жюри Евровидения. Интересно, что последнее дало оценки несколько ниже, чем эксперты. Шульте остановился на этом варианте именно из-за хороших оценок данной песни. Далее речь пошла об отборе этого года. 965 кандидатов были рассмотрены, из них 400 подали заявки сами, а остальные были предложениями и рекомендациями. Внутреннее жюри из десяти человек сократило список до 198. Эти кандидаты были отправлены на рассмотрение жюри. В этом году 50 членов жюри Евровидения сменились. Рекламная кампания в социальных сетях достигла 1.5 млн людей, из них 12 тысяч подали заявки, и в конце концов были выбраны 50 лучших. Вольфганг Дальхеймер рассказал о работе с артистами, заявив, что в этом году решение жюри будет еще более сложным, чем в прошлом, все финалисты очень хороши, но также и индивидуальны. "Мы как минимум на таком же хорошем уровне, как и в прошлом году. Основа уже заложена". Были показаны видео, которые были сняты для Али Райан, Грегора Хэгеле и Македы, и поданы на рассмотрение жюри. Было рассказано, что работа в авторском лагере проходила в разных сочетаниях с 10 утра до полуночи или даже позже. В конце-концов, в среднем было записано четыре песни на каждого артиста. У жюри на рассмотрении сейчас 25 песен из лагеря от шести артистов, одна из них - дуэт. Также включены и другие композиции. Также рассматриваются еще два потенциальных участника. Всего, голосовать жюри будет по свыше чем 30 песням. Из них только две на немецком, остальные на английском языке. В зависимости от оценки двумя жюри двух дополнительных участников и их песен, в финале примут участие от шести до восьми исполнителей. На вопрос присутствующих гостей, было отвечено, что финал национального отбора пройдет в Берлине на 8й неделе. Зрители, эксперты и жюри Евровидения вновь будут иметь вес по 1/3 голосов. Йон Ола Санд вновь объявит голоса зрителей. Помимо Анке, глашатаем жюри Евровидения также будет мужчина. Сегодня в Минске Министр информации и коммуникаций Казахстана Даурен Абаев провел встречу с представителями Европейского Вещательного Союза Жан Филипом де Тендером (Директор Медиа) и Ваннесой О'Коннор (Директор по связям с членами союза). "В рамках встречи мы обсудили широкий спектр вопросов, включая возможность получения Агентством "Хабар" статуса полноправного члена этого объединения. Кроме того, мы пришли к соглашению проработать вопрос участия Казахстана в ближайшие годы в конкурсе Евровидение среди взрослых", заявил министр. Телевидение Кипра категорически опровергает любую информацию о том, что на Кипр прибывали для переговоров какие-то авторы потенциальных конкурсных песен, или что какие-либо артисты были приглашены для прослушивания каких-либо песен. Такое заявление телевидение Кипра сделало на запрос ОГАЕ Греции. ""Я знаю, что телеканал RIK действительно связывался с моим лейблом Minos-EMI и среди многих обсуждавшихся имен было и мое имя. Но моя позиция остается прежней, как и во все последние годы: Я должна сначала услышать песню, и она должна мне понравиться. Для меня было бы большой честью представить Кипр, или Грузию, или Грецию. Это все близкие мне страны. Нет, из Греции предложения я не получала"
Телевидение Кипра подтверждает контакты с лейблом Minos-EMI, но подчеркивает, что подобные, исключительно предварительные, контакты велись и ведутся с рядом лейблов - но на данный момент телеканал прежде всего сосредоточен на выборе конкурентоспособной песни, и лишь потом приступит к выбору артиста для ее исполнения. Dúo Dinámico, авторы песни-победительницы Евровидения 1968 La La La написали песню для Ноелии для участия в Eurovision Gala Operación Triunfo. "Это очень красивая и необычная песня из-за ее темы. Мы большие поклонники женщин, и всегда их очень уважали, потому песня - женская. Нам очень понравилась девушка, которая покинула шоу несколько недель назад - Ноелия. Это очень сильная, мощная певица, и нашей песне нужен кто-то, кто мог бы представить ее с энергией. Потому, если она будет выбрана для конкурса, мы бы хотели, чтобы она исполнила ее", заявили зачинатели испанской поп-музыки Manuel de la Calva и Ramón Arcusa. Ранее сама Ноелия говорила о желании выступить на Евровидении. Интересно, что в момент, когда она рассуждала о возможности выступить дуэтом с Фэймосом, певица отметила: "Если бы я была с ним, у нас бы получился своего рода Dúo Dinámico". Программа "The Next Star" (HaKokhav HaBa) оживила интерес Израиля к Евровидению, но символизирует конец эпохи реалити-шоу в стране. Шоу на канале Keshet 12 является единственным, у которого есть стабильные рейтинги, в то время как другие форматы музыкальных конкурсов, таких как "Голос", "X Factor", "Aviv or Eyal" или новый проект "The Four", неуклонно теряют зрителей. Реалити, которое превратило старый формат Kdam Eurovision в престижный конкурс с высоким рейтингом, в прошлом году смогло выбрать исполнительницу, которая принесла Израилю победу на Евровидении. Маарив обсудил формат национального отбора с экспертами и поклонниками конкурса. "Жанр реалити явно умирает или демонстрирует признаки очень низкого пульса", - объясняет Ясмин Сассон, доктор культурных наук и лектор. "Важно помнить, что музыкальные реалити достигли своего апогея в Израиле, когда начался энтузиазм по отношению к формату ("Вау, здесь есть прослушивания, любой может участвовать!"). Теперь, когда есть все больше и больше подобных программ, тяжело оставаться прикованным к одной из них". "The Next Star получает себе рекламу через национально признанный институт - Евровидение, - объясняет Том Модан, преподаватель и исследователь средств массовой информации. "Здесь это сработало на двух уровнях: технологические инновации и прозрачность процесса отбора артиста, который будет представлять нас на Евровидении. Это сделало программу более значимой, как будто мы все принимаем участие в национальной миссии по достижению победы в Евровидение, что придало программе очень глубокую интерактивность с зрителями, и это не говоря о самой системе голосования и формате программы, основанной на выборе аудитории"
"The Next Star преуспела в революционизировании формата отбора на Евровидение, потому что выбор теперь продолжается в течение всего сезона", - объясняет Гай Шахар, который управляет группой поклонников Евровидения в Израиле. "Я думаю, что этот метод работает, потому что время от времени вы можете судить о прогрессе конкурсантов более основательно, не полагаясь на одно впечатление, как в предыдущих системах отбора, как зрители, мы теперь видим, как участники исполняют песни разных жанров, мы лучше понимаем, каковы их сценические способности, способности создавать интерес и демонстрировать различные стили пения"
"То, что раньше было нишевым интересом, стало общенациональным прежде всего из-за The Next Star, к котором появились такие артисты, как Нетта Барзилай и Надав Гедж", добавляет Шахар. "Трудно требовать лучших результатов - потрясающая победа, которую мы не могли и ожидать, топ-10 и финалы, все это говорит о том, что The Next Star имеет огромный успех, поэтому даже на Мальте решили скопировать метод и использовать их собственное реалити, чтобы выбирать своего представителя, чего они никогда не делали, и я уверен, что успех Нетты и The Next Star в качестве платформы для выбора представителя в этом сыграли свою роль". "Самое лучшее, что произошло из-за The Next Star в последние годы, - это то, что Евровидение возвращается к публичному дискурсу и вызывает интерес", - объясняет Алон Амир, эксперт по «Евровидению» и автор книги "Три минуты вечности". "Конечно, победа Нетты - это замечательная вещь, были и менее хорошие достижения, но это то, что всегда происходит на Евровидении - отличные достижения наряду с мощными провалами. The Next Star - это формат, который транслируется много месяцев и, мне не особенно нравится, когда они показывают прослушивания людей, которые приходят туда, хотя они явно недостаточно хороши, и совершенно точно не станут нашей следующей звездой". "У каждого метода есть плюсы и минусы", - говорит Изхар Коэн, первый израильский победитель Евровидения в 1978 году. "Большой минус The Next Star заключается в том, что опытные артисты и профессионалы не выступают на нем. Возможно, необходимо улучшить формат и добавить еще один путь для известных артистов, которые также могли бы быть выбраны, и где песня играла бы определенную роль в выборе представителя, как в предыдущих вариантах отбора. Меня постоянно спрашивают, буду ли я снова участвовать на Евровидении. Нельзя никогда говорить никогда, в этом и магия быть артистом, мы тоже иногда удивляем сами себя. Но ясно, что в The Next Star я участвовать не стану"
"Это действительно проблема, - соглашается Шахар. "Ветераны или известные исполнители должны будут соревноваться с новым и молодым поколением, но в формате The Next Star это проблематично, потому что это все таки реалити-шоу. Сложно ожидать, что успешные артисты примут участие в этом конкурсе". Первый эфир программы выйдет сегодня в 22:15 Москвы. Два новых имени были добавлены в список участников Melodifestivalen 2019 согласно источникам Aftonbladet: Мартин Стенмарк и Лиам "Liamoo" Какачан Томассен. 44-летний Стенмарк уже трижды принимал участие в шоу. В 2005 году он одержал победу с песней "Las Vegas" и представлял Швецию на Евровидении 2005, где занял 19 место. В 2014 году он вернулся с "När änglarna går hem", и попал во Второй Шанс. В последний раз он выступал в 2016 году с "Du tar mig tillbaks". Сейчас, по информации издания, он готов к четвертому участию. "Да, и у него очень хорошая песня", добавляет источник. Победитель "Идола" 21-летний Лиам "Liamoo" Какачан Томассен, также выступит на фестивале следующего года. В этом году Liamoo выступал с песней "Last Breath", которая попала напрямую в финал и заняла шестое место. В финале Идола он боролся с Ребеккой Карлссон, и теперь их дуэль может повториться на Мелодифестивалене. Mai Palling и Piret Järvis-Milder проведут программу Eesti Laul 2019. Start, в которой будут презентованы песни нового сезона шоу. Напомним, что она выйдет в эфир 1го декабря в 19:45 Москвы. Контракт с Опатией о проведении Доры 2019 близок к заключению. Хорватский национальный отбор на Евровидение 2019 Дора (названный так в честь хорватского композитора Доры Пеячевич) должен состояться 16 февраля во Дворце Спорта им. Марино Цветковича, в рамках проведения Дней HRT, в которые войдут еще два музыкальных вечера в Опатии - один вероятно будет посвящен серенадам Опатии, а другой покажет Симфоническо-Джазовый Оркестр HRT. "Я очень рад сообщить, что контракт с HRT об организации Дней HRT в Опатии в феврале близок к заключению. Опатия всегда была городом фестиваля, и я рад, что это знаменитое музыкальное событие вернется домой. Благодаря сотрудничеству Мэрии Опатии с Фестивалем Опатии, Опатия 21, Амадрия Парк Отелем было договорено, что все они внесут вклад в организацию Дней HRT в Опатии. Сейчас я могу подтвердить, что Дни HRT пройдут во Дворце Спорта им. Марино Цветковича и Конгресс Центре Gervais в три вечера, центральным из которых станет Хорватский отбор песни на Евровидение - Dora 2019. Билеты на Дору поступят в открытую продажу, так что их смогут приобрести все жители и гости города", говорит Иво Дуймич, мэр Опатии. "Мы ожидаем большого количества заявок от различных местных и даже иностранных авторов, но нужно помнить об условии, что песня должна исполняться местными исполнителями. Место проведения фестиваля, кто станет его режиссером и другие технические вопросы пока еще обсуждаются. Я с нетерпением жду этого проекта, как и любого, который развивает творчество и интересный контент. Музыкальное событие продлится три дня, и один из этих дней будет зарезервирован под День HRT, когда мы представим наш Симфоническо-Джазовый Оркестр", говорит руководитель проекта Дора Жельен Клаштерка. Ссылка на эту новость: страница Хорватии. Лидеры итальянских чартов, группа Måneskin заявила о своем интересе выступить на конкурсе Евровидение. В интервью Radio Italia, участник группы Дамиано Давид добавил, что осознает, что для попадания на Евровидение группе сначала надо одержать победу на фестивале Сан-Ремо: "Значит мы должны сделать это! ", говорит он. "Это будет абсолютно круто попасть на эту крупнейшую сцену в Европе, мы бы очень этого хотели, но мы обдумаем все в свое время, ведь нас ждут еще около 50 концертов"
Стоит отметить, что на даты фестиваля Сан-Ремо 2019 у группы запланировано начало Европейского турне, которое продлится весь февраль, а в марте группа продолжит его в Италии. Тур завершится 9 апреля. Исполнительный супервайзер конкурса Евровидение Йон Ола Санд уточнил свое вчерашнее заявление, касательно возможности участия Казахстана в конкурсе Евровидение 2019. "В 2019 году, Казахстан не будет участвовать в конкурсе Евровидение. Вопрос будет обсуждаться с Агентством Хабар, ЕВС и Организационной группы конкурса. Правила допускают исключения для ассоциированных членов ЕВС, каким является и Казахстан - но на данный момент он принимать участия в конкурсе не будет"
Несмотря на заявление Санда, все еще не исключается, что Казахстан может быть приглашен на Евровидение 2019 с гостевым номером. Это будет необходимо, чтобы оценить потенциальный спрос на эфир конкурса в стране при участии в шоу артиста из Казахстана - ведь время показа конкурса в этой стране будет с 1 до 4 часов ночи, и обычно эфиры проходят с очень низким рейтингом. Ранее, делегация Казахстана также подтвердила, что хотела бы провести в стране конкурс Детское Евровидение 2019. "Это возможно. На следующий год пока не определилась страна, в которой будет проводиться конкурс. Вопрос будет решать отдельная комиссия, и мы также будем участвовать", — заявил Председатель правления агентства "Хабар" Алан Ажибаев. По определенной информации, однако, делегация Казахстана предлагает перенести время проведения конкурса на октябрь, из-за погодных обстоятельств в Астане в ноябре. Это также совпадает и с планами ЕВС развития фестиваля Евровидение Азия, который может состояться с 30 ноября по 7 декабря в Австралии. Ранее, вебсайт Eurovision Ireland сообщил, что за Детское Евровидение 2019 поборется также Армения, представитель которой Давид Церунян сегодня был избран в Организационную группу конкурса. Сообщается, что Армения выступает за изменение ряда правил конкурса. В то же время Россия, которая ранее рассматривала возможность организации конкурса 2019 года в Сочи - заявку на проведение подавать не будет. Телевидение Черногории РТЦГ объявило состав отборочной комиссии, которая оценит все принятые заявки и выберет пять лучших из них для участия в финале Монтевизии. Михайло Радоньич - композитор, продюсер и аранжировщик. Отборочная комиссия была создана решением генерального директора РТЦГ Божидара Шундича. Период приема заявок завершается 28 ноября. Публика получит возможность познакомиться с песнями и их исполнителями в программах РТЦГ перед финалом национального отбора. Немецкий вещатель NDR возвращает формат Roadshow, которое пройдет на следующей неделе в Ганновере. В прошлом сезоне Евровидения, NDR не только пересмотрел формат национального отбора, но и постарался установить лучший диалог с фанатами - посредством Roadshow - дискуссионной встречи организаторов отбора с его поклонниками в разных городах страны. Roadshow стартует в следующий вторник 27 ноября в 18:30 в Haus der Bürgerinitiative Raschplatz e.V. (Lister Meile 4, 30161 Hannover). В нем примут участие директор развлекательного вещания NDR Томас Шрайбер, глава делегации Кристоф Пелландер, Андреас Вейфюртер из Simon Kucher & Partners и Вернер Клёч из digame mobile. Завтра, Шрайбер, Пелландер и музыкальный директор Вольфганг Дальхеймер посетят встречу фан клуба EC Germany в Кельне. В 16.45: Gloria, Apostelnstraße 11, 50667 Köln. Для тех фанатов, кто не сможет прибыть в Ганновер или Кельн - в ближайшем будущем будет проведен прямой эфир в Facebook с ответами на вопросы, сообщает Prinz Blog. В первом выпуске шоу "The Next Star for Eurovision" религиозный конкурсант Шахар Адави исполнит песню "Википедия" Ханана Бен-Ари, и вызовет восторг членов жюри. "В этом году мы проводим Евровидение в Израиле и важно, чтобы то, что выставит принимающая страна демонстрировало израильский характер", говорит участник Евровидения 2010 и член жюри "Следующей звезды для Евровидения" Арель Скаат, добавляя: "Если к нам приходит религиозный человек, иудей, то это прежде всего интересно, это возвращает нас к нашим истокам". "Думаю, что из победы Нетты мы поняли, что интересные, отличающиеся от других люди, конечно же, которые хорошо поют, могут отлично выступить на конкурсе и стать звездами в Израиле", говорит Скаат. Вчера латвийский вещатель LTV провел второй раунд прослушиваний перед Supernova 2019. В них приняли участие 33 артиста и группы. Среди участников были замечены: Маркус Рива, Микс Дукурс, Кристиана Бумбьере, Dziļi Violets и Double Faced Eels. Имена участников Supernova 2019 будут объявлены 5го декабря 2018 года. 26-летняя Анна Бергендаль, победительница МФ 2010 возвращается на шоу. На прошлой неделе певица выпустила рождественский сингл "Just another christmas". "Она достаточно сильно обожглась в прошлый раз, но теперь она чувствует готовность. Я думаю, что она ждет реванша. И, прежде всего, у нее очень сильная песня", говорит источник издания. Финалистка Идола 2006 18-летня Ребекка Карлссон также примет участие в Melodifestivalen 2019. По информации источника издания, 27-летняя Маргарет также получила место в конкурсе следующего года. Телеканал RAI опубликовал 25 песен победителей академии Area Sanremo TIM 2018, которые претендуют на участие в фестивале Sanremo Giovani. Прослушивание финалистов Area Sanremo пройдет в понедельник, 26 ноября. Из числа этих участников, и 69 исполнителей, принявших участие в прослушивании 12 ноября, 24 артиста будут выбраны для двухдневного фестиваля Sanremo Giovani. Имена финалистов будут названы 27 ноября в 12:30 Москвы в специальном эпизоде программы Radio2 Social Club. Гостем ведущих Люки Барбароссы и Андреа Перрони станет художественный директор фестиваля Сан-Ремо Клаудио Бальони. Прослушать песни победителей Area Sanremo TIM 2018 можно здесь. Прослушать ранее опубликованные песни участников прослушиваний Sanremo Giovani можно здесь. Прошло распределение песен 10 Гала Operación Triunfo 2018. В этом Гала впервые прозвучит гимн сезона 2018 Somos. Марилия, выбывшая конкурсантка OT 2018, пообщалась с прессой. Певица заявила, что победителем шоу могли бы стать Наталья или Фэймос. На вопрос, хочет ли она представлять Испанию на Евровидении, певица заметила: "Почему бы и нет. Это вопрос подготовки". "Прежде всего это потому, что я считаю, что у Фэймоса есть все необходимое для участия в Евровидении и он должен добиться там хорошего результата"
Участник Евровидения 2010 и член жюри "Следующей звезды для Евровидения" Арель Скаат рассчитывает на вторую подряд победу своей страны. "В этом году мы проводим Евровидение в Израиле и важно, чтобы то, что выставит принимающая страна демонстрировало израильский характер", говорит Скаат. "Думаю, что из победы Нетты мы поняли, что интересные, отличающиеся от других люди, конечно же, которые хорошо поют, могут отлично выступить на конкурсе и стать звездами в Израиле", добавляет Скаат. "Мы уже прослушали множество интересных исполнителей, и я начал отмечать тех, кто, по моему мнению, может победить на Евровидении. Я действительно рассчитываю на двойную победу"
Кристер Бьоркман очень бы хотел, чтобы в Мелодифестивалене 2019 приняла участие Петра Марклунд и он держит для нее открытое место в шоу. Менее чем за 5 дней до презентации участвующих в шоу артистов, несколько мест остаются открытыми, поскольку Кристер Бьоркман пытается убедить принять участие несколько артистов своей мечты. "После успеха "Händerna mot himlen" она была именем, о котором часто говорили SVT и Кристер Бьоркман. Теперь они чувствуют, что было бы подходящим временем для нее, чтобы принять участие в конкурсе, говорит источник. Но Петра еще не приняла предложение. Согласно одному из источников, одним из обсуждений является вопрос о том, должна ли Петра Марклунд выступить под своим именем или сценическим именем September. "Она действительно может использовать международную узнаваемость и стать победителем Евровидения если выступит как September, но в то же время крупнейшие хиты в Швеции были изданы под ее настоящим именем". Поскольку организаторы МФ оставляют места открытыми, оставшиеся артисты могут получить подтверждение своего участия всего накануне конкурса. Один из артистов, о готовности которого сообщал ранее Aftonbladet - Магнус Карлссон. Но теперь надежные источники говорят, что это совсем не так. Магнус все еще ждет сообщения, будет ли для него место в Melodifestivalen или нет. Представители делегации Тель-Авивского Евровидения встретятся в конце недели со своими коллегами из муниципалитета Стокгольма и посетят объекты предыдущих конкурсов Евровидения. Делегация муниципалитета Тель-Авив-Яффо проведет профессиональный тур во всемирную столицу Евровидения - Стокгольм, чтобы узнать у экспертов, как правильно готовится к конкурсу. Члены делегации Тель-Авива - представитель муниципалитета Гиди Шмерлинг в качестве директора Евродеревни и директора по маркетингу конкурса, а также Эйтан Шварц, директор Tel Aviv Global, который отвечает за работу с туристами, которые посетят конкурс в мае. В эти выходные они проведут встречи со своими коллегами в муниципалитете Стокгольма и посетят объекты города, который принимал Евровидение уже три раза. Ожидается, что они побывают на Эрикссон Глобен, 16-тысячной Арене, где состоялся конкурс в 2016 году, в мэрии, где прошла церемония открытия и красная ковровая дорожка, в Kungsträdgården, где базировалась Евродеревня, и в королевском дворце - напротив которого были расположены Евроклуб и Еврокафе. Представители Тель-Авива рассмотрят вопросы логистики, такие как маркетинг, гостеприимство, транспорт, мобильность во время конкурса и многое другое. Например, как и у Globen Arena в Стокгольме, и у Altis Arena в Лиссабоне, Тель-Авив Экспо также имеет близлежащую железнодорожную станцию, которая должна будет выдержать максимальные нагрузки. Шведы достигли такого высокого уровня профессионализма, что они в последний раз инвестировали в конкурс самую низкую сумму за последние годы - менее 10 миллионов евро благодаря впечатляющей инфраструктуре и эффективности, пишет Time Out. Им даже удалось получить прибыль от мероприятия - то, о чем израильские организаторы могут только мечтать. Единственное, в чем Израиль понимает лучше - область безопасности и кибер-безопасности. В последние годы израильские специалисты консультировали по вопросам безопасности в различных проектах Евровидения. Исполнительный супервайзер Евровидения Йон Ола Санд дал свой первый комментарий по поводу возможности участия Казахстана на взрослом конкурсе Евровидение. "Нам нужно обсудить, можем ли мы пригласить Казахстан, нашего ассоциированного члена из Казахстана, на конкурс Евровидение, но это часть более широкой дискуссии, которая ведется в ЕВС, потому я надеюсь, что смогу дать больше информации по этому вопросу позднее"
Напомним, что телеканал Хабар из Казахстана является Ассоциированным членом Европейского Вещательного Союза. Согласно Уставу ЕВС возможности участия в нем подразделяются на: просто "Членов" и "Ассоциатов" (Ассоциированных членов). Таким образом, под "Членами" понимаются полноценные члены ЕВС (ранее называемые "Активными членами". Начиная с 2018 года, правила конкурса Евровидение, принятые Европейским Вещательным Союзом, вводят термин "Гости ЕВС": "Только телевизионные вещатели, являющиеся Членами могут принимать участие в Евровидении. Постоянная служба ЕВС может применять дополнительные правила, чтобы обеспечить участие достаточного количества вещателей, соответствующего формату шоу. При условии одобрения со стороны Организационной группы, на ежегодной и исключительной основе, Постоянная служба ЕВС может приглашать в качестве "гостей" вещателей из стран, расположенных за пределами территории Европейского Вещательного Союза и чье участие ЕВС кажется полезным для Евровидения, принимать активное участие в конкурсе (т.е. с конкурсантом, представляющим их страну). ЕВС и Организационная группа имеют дискреционное право определять тех вещателей, которых они желают пригласить. Подобные приглашения должны делаться на ежегодной основе, и ни в коем случае не наделяют ни одного приглашенного вещателя автоматическим правом принимать участие в последующих конкурсах"
В этом году песни, принимающие участие в эстонском отборе Eesti Laul будут представлены в виде видеоклипов. Их можно будет увидеть в рамках презентации "Eesti Laul 2019. Start" с ведущими Mai Palling и Piret Järvis-Milder 1 декабря в 18:45 местного времени или на вебсайте проекта после. Пока неизвестно, будут ли это полноценные музыкальные клипы, поскольку ТВ презентация будет идти всего 45 минут. На фото: кадры со съемок видео Дженифер Коэн. Участница дуэта Eva+Manu Ева Лоухивуори сделала новое заявление, касающееся слухов об их участии в Евровидении. "Так. В воскресенье я услышала, что Iltalehti сообщила (или предположила, без разницы), что мы станем следующими представителями Финляндии на Евровидении. Тема вышла из-под контроля, и теперь это же пишут по всей Европе, и мы постоянно получаем как позитивные, так и негативные отзывы от слушателей и СМИ. Подозрение Iltalehti началось с нашего поста, где мы упомянули, что нас ждет следующей весной нечто новое и захватывающее. Ну, на этот момент, я могу только сказать, что наш следующий год обещает быть замечательным, прежде всего потому (и о чем и был пост), что после долгого ожидания, наконец, в начале года выйдет наш новый релиз". Как вы думаете, действительно ли они выбраны представлять страну на Евровидении? Или они - одни из финалистов национального отбора? Или примут участие в нем как авторы песен? Марилия с 47% голосов уступает Марте и покидает Академию Operación Triunfo 2018. Мики становится фаворитом публики. Он уже был фаворитом в 5м Гала, таким образом он становится первым конкурсантом, ставшим фаворитом дважды. В тройку также попали Альба Рече и Фэймос. Альба, Наталья и Сабела спасены жюри от номинации. Из четырех номинантов Фэймос спасен преподавателями Академии, Хулия (3 голоса) - другими конкурсантами, таким образом Мария (2 голоса) и Марта (0 голосов) номинированы на вылет в следующей программе. Два популярных литовских исполнителя заявили о своем интересе к участию в Евровидении. Paola Hart (Паулина Паулаускайте) заняла третье место на шоу "X Factor" в 2017 году и была названа одной из самых популярных среди телезрителей участниц проекта. В том же году она стала пятой на фестивале "Славянский Базар". Недавно она выпустила свой первый сингл на литовском языке "Liksiu čia"
Паола, которая учится в Королевской Консерватории в Шотландии, вернется в Литву в начале декабря, и рассматривает возможность своего участия в Евровидении. "У меня много планов на будущее: Я думаю об участии в отборе Литвы на Евровидение, а также об открытии собственного дела, которое, конечно же, будет связано с музыкой - детской вокальной студии", говорит певица TV3. Группа The Roop недавно вернулась из Сан-Франциско, а ее лидер Вайдотас Валиукевичус жил и работал месяц на острове Фуэртевентура у берегов Африки. Отмечая четвертую годовщину, группа подумывает о возвращении на Евровидение. Они даже провели опрос среди подписчиков своей страницы в социальной сети, которые дали ответ: "Конечно, стоит принять участие". "Мы не будем скрывать, мы рады получить такую поддержку. Подадим ли мы заявку, пока сказать не можем. Мы обсуждаем и обдумываем этот вопрос. До конца приема заявок еще есть достаточно времени. Но да, есть хороший шанс, что мы послушаем мнение людей", Вайдотас говорит Zmones. Прием заявок в Литве завершается 10 декабря. Глава отдела развлекательного вещания австрийского телеканала ORF Эдган Бём уйдет в конце года на пенсию. На своем посту он отвечал не только за такие популярные форматы, как Starmania или Dancing Stars с 1999 года, но и детские программы, кабаре, комедии, Opernball & Life Ball и пр. Бём был исполнительным продюсером Евровидения 2015. Одной из его последних задач станет выбор представителя страны на Евровидение 2019. Как и в прошлые годы, ветеран радиостанции Ö3 Эберхард Форшер прослушал и представил на рассмотрение Бёма ряд потенциальных кандидатов на поездку в Израиле. Внутреннее решение должно быть принято в декабре, и по информации издания Kleinezeitung - это может быть мощная баллада или динамичный поп-дуэт. Греческий телеканал Star TV сообщает, что киприотский вещатель RIK назначил встречу с певицей Тамтой, чтобы она смогла прослушать все песни, которые были предложены вещателю для участия в Евровидении. Это противоречит информации Alpha TV, что песня Кипра для Евровидения 2019 уже была записана. Eurovision Fun сообщает, что помимо Алекса Папаконстантину, который вскоре должен прибыть на Кипр, заявка также была получена от шведского композитора Линнеи Деб. Полагают, что у RIK есть по меньшей мере четыре песни от известных авторов. Официально, вещатель заявляет, что несмотря на слухи о различных артистах: Тамта, Вангелис Какуриотис и др, RIK в настоящее время фокусируется на завершении процесса отбора лучшей песни, которая представит Кипр. Вещатель провел контакты с различными рекорд-лейблами, так что у него есть возможность выбора, в зависимости от того, какая песня будет выбрана. Новое имя появилось в слухах от Греции: People Greece пишет, что Никос Ганос встречался с представителями канала ERT. Певец не подтверждает эту информацию, но заявляет, что для него было бы очень приятно принять участие в конкурсе. В других новостях, греческая певица Эльпида рассказала, что отправится в Тель-Авив для участия в большом мероприятии в рамках конкурса Евровидение, на которое были приглашены ряд бывших участников конкурса. Эльпида исполнит свою конкурсную песню 1979 года Socrates вместе с Тель-Авивским симфоническим оркестром. Дополнительная информация: страница Кипра, страница Греции. Официальная презентация участников фестиваля состоится 27 ноября. Dolly Style потратили большую часть осени на тестирование новых песен, и смогли-таки найти такую, которая пришлась по душе шлягер-генералу Кристеру Бьоркману. Группа дебютировала в МФ в 2015 году, и вновь участвовала в следующем. На сегодняшний день, в ней не осталось ни одной участницы из оригинального состава, а не далее как в этот понедельник было объявлено, что скоро будет представлена новая "Полли". 18-летняя Ханна Ферм принимала участие в Идоле 2017 года, где заняла второе место. В прошлую пятницу в шоу талантов она исполнила дуэт с участницей Браги Бергссон. Ранее уже сообщалось, что 44-летний Магнус Карлссон и 35-летний Йон Лундвик имеют высокие шансы попасть на фестиваль, и продолжают поиск песен. По источникам газеты им это удалось. Из вероятных, но пока не подтвержденных участников в списке осталась только Маргарет. Конкурс Евровидение в Израиле скорее всего сможет преодолеть последнее препятствие. Ожидается, что Израильская Вещательная Корпорация КАН согласится на условия займа, который Министерство финансов выделит для подготовки конкурса. Однако это решение еще не окончательно. Совет директоров КАН поручил менеджменту вещателя изучить вместе с Министерством финансов условия займа, который позволят подготовить Евровидение 2019 в стране. Данная директива была принята, несмотря на объяснения совета директоров, что выделение 110 млн. шекелей (26 млн Евро) из бюджета корпорации на финансирование мероприятия представляет собой реальную трудность для вещателя и может нанести вред как творчеству, так и сотрудникам. Однако члены правления заявили, что они "считают, что проведение конкурса в Израиле имеет большое значение для имиджа и экономического аспекта страны, и поэтому совет одобрил рассмотрение условий займа". Вопрос бюджетирования Евровидения со стороны государства был включен в повестку заседания правления вещательной корпорации после шторма, возникшего из-за решения правительства о предоставлении необходимого финансирования только в качестве займа. На основе проекта, представленного Европейскому вещательному союзу, бюджет конкурса оценивается в 157 млн. шекелей (37 млн Евро), при этом доходы от продажи билетов, спонсорства и взносов участников составят примерно 40 млн. шекелей. На сегодняшний день, министерство финансов согласилось дать в займ только 70 млн шекелей, хотя КАН подчеркнул, что недостающий бюджет составляет 110 млн. Наряду с этим, государство Израиль, как ожидается, получит выгоду от туристов, которые наводнят Тель-Авив в преддверии конкурса, а также получит глобальную площадку для улучшения имиджа страны за рубежом. Общий годовой бюджет корпорации составляет около 650 миллионов шекелей, а это означает, что если она будет вынуждена финансировать конкурс из своего кармана, оригинальные программы пострадают прежде всего. Решение было принято, несмотря на решительные рекомендации генерального директора КАН Эльдада Кобленца о том, чтобы отклонить займ. "Закон требует, чтобы корпорация инвестировала и взращивала израильское творчество и местный производственный рынок. Займ нанесет ущерб израильскому творчеству и работникам канала, поэтому я бы рекомендовал совету не принимать предложение о займе для Евровидения", заявил он вчера. За бурные полгода, прошедшие с момента победы Нетты Барзилай, Кобленц дал понять, что не хочет, чтобы КАН сам финансировал организацию конкурса, даже под угрозой отмены его проведения в Израиле. В то же время правительственные чиновники направили послание Гилю Омеру, председателю совета директоров и генеральному директору компании Кобленцу, о том, что если конкурс Евровидение в конечном итоге не состоится в Израиле из-за различных бюджетных споров, то новый общественный вещатель будет просто-напросто закрыт. В этом случае, КАН также потеряет 12 млн евро финансовой гарантии, которую Корпорация уже взяла на условиях займа - они отойдут новой стране-организатору. Решение было принято большинством из семи человек, двое проголосовали против, среди них и Кобленц (который не входит в состав совета). В ближайшие дни, корпорация и Министерство финансов обсудят сумму займа и условия его возвращения в следующие годы. Решение сегодняшнего вечера оставляет корпорации и правительству возможность маневрировать в вопросе бюджета Евровидения, когда обе стороны все еще могут выйти из тупика, в который они зашли и достичь компромисса, который позволил бы конкурсу пройти в Израиле. Окончательное решение относительно него будет принято только позднее. Дополнительная информация: страница организации мероприятия. В продажу поступили билеты на полуфиналы национального украинского отбора на Евровидение 2019, запланированные на 9 и 16 февраля. Приобрести их можно здесь: karabas.com или concert.ua. Стоимость билетов: 320 - 1090 грн. Билеты на финальное шоу поступят в продажу в январе. Телеканалы СТБ и UA: ПЕРШИЙ снова объединились, чтобы в четвертый раз провести Национальный отбор на Евровидение-2019. Присоединяйся, чтобы оказаться в самом центре масштабного конкурса, о котором говорит вся страна. Почувствуй невероятную энергетику зала и эмоции участников. Выбери артиста, который достойно представит Украину на Евровидении-2019 в Израиле. Получи уникальную возможность лично увидеть все самое интересное - то, что обычно остается за телевизионным кадром. Израильская Общественная Вещательная Корпорация планирует снять новый комедийный сериал, в котором будет показана попытка террористов ИГИЛ сорвать проведение конкурса Евровидение. Что произойдет если террористическая организация сможет добраться до Евровидения? Нет сомнения в том, что об этом опасении задумываются многие жители Израиля. Помимо подготовки мероприятий по безопасности, они решили встретить эту ситуацию с юмором. Ведь немного юмора никогда не повредит. Израильский вещатель KAN, который отвечает за проведение конкурса Евровидение 2019, хочет снять новый комедийный сериал, который будет рассказывать о французском исполнителе-мусульманине Гее Бароне, которого отправляют на Евровидение, где с одной стороны Моссад подозревает его в терроризме, а с другой преследует ИГИЛ. Комедийный сериал будет носить название "Дуз Пуа" (предварительно) и возможно будет показан уже весной перед самим Евровидением в Израиле. Планы пока в самом начале, ведется поиск израильских и французских актеров. Ожидается, что съемки начнутся в январе. Над сериалом будет работать режиссер Дани Сиркин (который ранее в этом году работал над "Стокгольмом" Ноа Эдлин). В 2003 году он уже был вовлечен в съемки популярного фильма "Hallelujah" - комедии, действие которой происходит во время проведения конкурса Евровидение 1979 в Израиле. Хорватский вещатель HRT опубликовал правила проведения национального отбора DORA 2019. DORA будет состоять из одного вечера, который выйдет в прямом эфире на телеканале HRT в феврале 2019 года. Прием заявок на участие в конкурсе осуществляется с 20 ноября по 10 января. В конкурсе могут принимать участие только песни, которые не были обнародованы ранее. Текст песни должен быть написан на одном из четырех языков: хорватском, английском, французском или итальянском. Исполнители должны быть гражданами Хорватии и на момент подачи заявки им должно исполниться 16 лет. Из числа полученных заявок будут выбраны 16 участников и 2 запасных. В отборочное жюри войдут представители HGU (Союза музыкантов Хорвтии), HDS (Хорватского союза композиторов) и HRT, музыкальные критики, исполнители с опытом участия в Евровидении, композиторы и авторы песен, выбранные HRT. Они должны руководствоваться исключительно художественной ценностью песни, с упором на качество музыки, текста и работы в целом. HRT оставляет за собой право определить порядок выступлений на Доре. Во время прямого эфира лучшая песня будет выбрана совместным голосованием телезрителей и жюри. Его точные правила будут опубликованы не позднее 31 января. Онлайн-площадка для поиска краткосрочной аренды частного жилья Airbnb решила удалить все списки домов, выставляемых на аренду, в еврейских поселениях на Западном берегу - в анклавах, которые большинство мировых держав считают незаконно захваченными территориями, где палестинцы стремятся к созданию независимого государства. "Мы пришли к выводу, что мы должны удалить все жилье в израильских поселениях на оккупированном Западном берегу, которые лежат в основе спора между израильтянами и палестинцами", - говорится в заявлении на веб-сайте Airbnb. "Наша надежда заключается в том, что когда-нибудь будет найдено решение этого исторического конфликта, которое удовлетворит все мировое сообщество, и предложен четкий путь выхода из него". Представитель Airbnb сообщил, что решение, затрагивающее около 200 позиций, вступит в силу в предстоящие дни. Ярвин Левин, министр туризма, объявил о том, что он начал принимать срочные меры по ограничению деятельности компании Airbnb по всей стране. Он настоятельно потребовал, чтобы администрация Airbnb отменила дискриминационное решение, подчеркнув, что оно является позорным и жалким. "Если вы придерживаетесь политики дискриминации против израильтян, то вы не можете зарабатывать деньги в Израиле", заявил он The Associated Press. Также он отметил, что правительство будет помогать владельцам жилья на Западном Берегу подать в суд на компанию, чтобы заставить ее "заплатить" за свое решение. Левин добавил, что Израиль наложит на Airbnb и другие ограничения на ее деятельность в стране, без уточнения какие. В то же время Левин поручил руководству своего министерства осуществить специальную программу поощрения туризма и размещения в апартаментах для отдыха на всей территории Иудеи и Самарии. На данный момент нет информации о том, какие ограничения могут быть применены к Airbnb и могут ли они повлиять на проживание гостей конкурса Евровидения. Италию на Евровидении 2019 вновь получит возможность представить победитель 69 Фестиваля Итальянской песни Сан-Ремо. Сегодня телеканал RAI опубликовал правила его проведения. Если этот артист откажется от данного права, то RAI сможет выбрать представителя страны, используя собственные критерии. Как сообщалось ранее, фестиваль Сан-Ремо 2019 будет проведен 5-9 февраля в театре Аристон в Сан-Ремо. В фестивале будут участвовать 24 артиста. Для составления состава участников художественный руководитель фестиваля Клаудио Бальони и Дирекция Rai Uno смогут использовать помощь Музыкальной комиссии в соответствии с критериями, которые будут учитывать качество и оригинальность песен , а также уровень исполнения и требования современности, известности и признанной ценности исполнителей. Два места в фестивале будут зарезервированы для победителей конкурса Sanremo Giovani, которые должны будут представить новую песню. Все песни в конкурсе должны соответствовать следующим критериям: текст песни должен быть на итальянском, хотя короткие фразы на других языках разрешены; песни должны быть новыми на момент подачи заявки и оставаться таковыми до первого выступления на фестивале; Продолжительность песни не должна превышать четырех минут. Крайний срок подачи заявки на участие в фестивале - 7 декабря 2018 года. Заявки должны быть отправлены в RAI - Организацию фестиваля, via Montesanto 68, 00195 Rome. В заявке должен быть указан предлагаемый приглашенный исполнитель на четвертый вечер. Участники конкурса будут объявлены RAI до субботы, 22 декабря - скорее всего, во время трансляции Sanremo Giovani. В первый вечер фестиваля будут представлены все песни и будет проведено трехуровневое голосование: Телеголосование (40%), Жюри Demoscopica (30%), Жюри прессы (30%). На второй и третий вечер будут представлены по 12 песен, и будет использоваться то же трехуровневое голосование. Четвертый вечер будет дуэтным, когда участники будут исполнять свои песни с помощью приглашенных артистов, определенных по согласованию с художественным руководителем и Rai Uno. Голосование будет проводиться Телеголосованием (50%), жюри прессы (30%) и жюри экспертов (20%). Голоса этого дня войдут в общий подсчет баллов, а также Rai Uno оставляет за собой право вручить приз самому популярному гостю вечера. В пятый и последний вечер все 24 песни будут исполнены снова, будут использованы телеголосование (50%), жюри прессы (30%) и жюри экспертов (20%). Будет рассчитан комбинированный рейтинг за все дни, и три лучшие песни выйдут в Суперфинал. Они будут представлены снова, а для определения победителя будет использована та же самая система голосования. Карлос Джин удалил свою "идеальную песню", чтобы внести в нее ряд изменений из-за полученной критики. "Я должен внести пару изменений, потому что из-за спешки есть несколько моментов, которыми я не очень доволен", признал композитор. "Давайте не будем проливать кровь", музыкант призвал своих подписчиков в соцсети, перед тем как сообщил, что будет вносить изменения, "ведь у нас демократичный процесс". "Хотя самое важное в песни это мелодия и текст, мы попробуем кое-что поменять", говорит Джин в новом ролике, размещенном на Youtube, где объясняет свое решение переделать песню. "Из тех мелодий, что вы прислали мне, я постарался добиться наилучшего результата. Идея была создать идеальную песню для Евровидения, авторами которой было бы множество простых людей, это эксперимент, который может оказаться удачным, а может быть и нет", рассказал музыкант. "Было бы полезнее, если бы вы присылали предложения, а не просто критику", говорит Джин. который заявил, что получил слишком мало вариантов, по сравнению с другими проектами. Телекомпания ERR провела сегодня официальную презентацию артистов, принимающих участие в Eesti Laul 2019. Также было объявлено распределение на полуфиналы. В интервью Raadio 2, новый босс Eesti Laul Томи Рахула описал изменения в конкурсе и обсудил формирование жюри отбора. "Цели нового Eesti Laul - продвигать старые традиции, просто обновляя некоторые вещи", - говорит Рахула. Одно из изменений заключалось в том, что полуфиналы будут выходить в прямом эфире. "Напряжение для конкурсантов станет еще больше, будет похоже на само Евровидение, где у вас нет нескольких шансов, это прямая трансляция, и люди будут голосовать на этой основе", - объяснил Рахула. Кроме того, Рахула хочет улучшить качество музыки в конкурсе благодаря своим изменениями. "Сделать авторов песен более мотивированными и повысить их уровень. Аналогичным образом, и в телевизионной картине уровень будет расти. Мы произведем небольшие обновления - маппинг и некоторые другие вещи, которые еще не были использованы в шоу ранее", - сказал Рахула, добавив, что в телевизионном изображении будут задействованы проекции. Рахула согласен с тем, что сокращение количества поданных заявок связано с введением взноса за участие, но говорит: "Я думаю, что, конечно, некоторые треки не были отправлены, потому что люди поняли, что если это какая-то шутка, то почему они должны тратить свои деньги. Несмотря на плату, количество участников по-прежнему было очень большим, и это очень хорошо. Я слышал песни, и очевидно, что люди тщательно думали, прежде чем отправлять свои записи. Среди них было и несколько настоящих жемчужин. В основном, это по-прежнему иностранная поп-музыка или поп-рок. К сожалению, ясно, что песни на английском языке были лучше подготовлены и лучше записаны, чем песни на эстонском языке". Новое правило заключается в том, что песни, представленные на конкурс, не должны публиковаться до 4 декабря. "Я хотел бы, чтобы все артисты имели право на равный старт", - сказал Рахула. "Когда мы стартуем, у всех будет возможность отрекламировать свои записи", добавляет он. В отборочное жюри был включен только один представитель ERR. Рахула не считает, что частные СМИ захватили Eesti Laul. "Мне доставляет удовольствие иметь в жюри представителей любых СМИ. Важно, чтобы состав жюри, который я собрал, был компетентен, в него вошли те, кому я доверяю, - объяснил Рахула. Спорным вопросом было включение Карла-Эрика Таукара, чья подруга Керли Кивилаан принимает участие в конкурсе. По словам Рахулы, такие ситуации были и раньше. "Когда я спросил Таукара, согласен ли он принять участие в отборе, он сразу же сказал, что Керли примет участие. Я сказал, что нет никакой разницы, давай". По словам Рахулы, в жюри также были члены, у которых были близкие друзья среди певцов. "Мы попросили членов жюри не давать оценки своим близким, были некоторые, кто оставил ряд песен без оценки, потому что они были как-то связаны с ними, это было очень честно, и я не сомневаюсь в людях, которых я осмелился выбрать", - сказал Рахула. Очередность выступления полуфиналистов пока неизвестна. По сообщению программы Me Agapi Christiana телеканала ALPHA TV Кипр, песня, которая представит страну на Евровидении 2019 уже была записана. Комментируя песню, в программе отметили, что она довольно хороша, и даже лучше, чем Fuego. В шоу не было обозначено, кто является исполнителем данной песни, но все источники указывают, что ею может являться Тамта. Вебсайт Eurovision Fun сообщает, что в четверг, 22 ноября, автор песни Алекс Папаконстантину прибудет на Кипр в сопровождении шлягер-генерала Кристера Бьоркмана, чтобы утрясти последние детали. Таль Форер был назначен музыкальным продюсером и аранжировщиком Евровидения 2019, сообщает Walla. Форер создаст музыкальную тему мероприятия, а также музыку для посткардов конкурса. 40-летний продюсер, аранжировщик, композитор и пианист Тал Форер является одним из самых активных и выдающихся музыкантов Израиля. Среди прочего, он был музыкальным продюсером шоу Голос, начиная с первого сезона. Он работал с такими артистами как Шломо Арци, Шломи Шабат, Харель Скаат, Сарит Хадад, Эял Голан и другими. Режиссер Керен Хохма (которая создала видеоклип на песню "Toy") и арт-директор Шмуэль Бен Шалом были назначены ответственными за изготовление посткардов. Продакшн компания для открыток будет выбрана в ближайшее время на специальном тендере, запущенном KAN. По информации Walla, 42 представителя участвующих стран приедут для съемок открыток в Израиль в апреле, а из-за временных ограничений с ними будут одновременно работать несколько режиссеров, которых будут координировать Хохма и Бен Шалом. В прошлом известный хореограф, Карен Хохма впоследствии занялась режиссурой музыкальных видеоклипов, и сегодня она является одним из ведущих коммерческих, телевизионных и музыкальных режиссеров в Израиле. Она является обладателем международной премии MTV и трех премий Академии телевидения Израиля. Ее работы очень визуальны и чувственны, вдохновение она черпает из своего танцевального опыта, создавая уникальный ритмичный язык. Шмуэль Бен Шалом - арт-директор, работающий в рекламе, телевидении и кино. Он является владельцем OCD, компании, специализирующейся на архитектуре и промышленном дизайне. Он был главой отдела графики американского фильма "The Insider" и декоратором на "Spy Games". Его работы были продемонстрированы на дизайнерских и художественных выставках по всему миру. Популярные исполнители написали на своей странице в Фэйсбук "Мы с огромным нетерпением уже ждем весны 2019, потому что... 🎶🙊💖 #evamanu #оченьскоро"
Также группа разместила в инстаграме скриншот статьи газеты Italehti, где они были названы потенциальными участниками Евровидение и фото победителей Евровидения 2006 Lordi. В Мальтийском X Factor завершился этап Bootcamp (Тренировочный лагерь). После Стены песен в борьбе осталось 47 исполнителей, включая 8 свежесформированных групп. Также стало известно, за какую из категорий будет отвечать каждый из членов жюри. Группы (10) (Александра Олден): Kayati, Clelis, 4th Line (Anthea Bezzina, Nicole Falzon, Milena Bianco, Miriana Conte), Extreme (Nicole Azzopardi, Elishia Semaan, Martha Micallef Attard, Lindsay Pace), Systm 12 (Kyle Cutajar, Dario Mifsud Bonnici, Josef Tabone), Sudden Crown (Stefan Galea, Mikhail Attard, Ryan Grech, Clayton Portelli), Horizon (Kurt Anthony, Matthew Grech), Lorelai (Gabrielle Portelli, Cynthia Zaffarese), Prism (Denise Mercieca, Sarah Bonnici, Martina Micallef, Aaliyah Mallia), Radiate (Raquel Seguna, Rachel Mamo, G.O.L.D). Парни (11) (Ира Лоско): Aleandro Pace Tahir, Owen Leuellen, Isaac Mercieca, Aidan Cassar, Norbert Bondin, Mark Anthony Bartolo, Claudio Zammit, Miguel Bonello, James Mifsud, Luke Chappell, Matthew Anthony Caruana. Девушки (14) (Ховард Кит): Kelsey Bellante, Raisa Marie Micallef, Michela Galea, Victoria Sciberras, Nicole Frendo, Karin Duff, Shauna Vassallo, Jade Vella, Nicole Brincat, Kaylie Magri, Gail Attard, Kelly Moncado, Danica Muscat, Michela Pace. Старше 25 (12) (Рэй Мерчика): Kim Cortis, Janice Debattista, Janice Mangion, Franklin Calleja, Vanessa Sultana, Anna Azzopardi, Laura Bruno, Chris Grech, Anna Faniello, Rachel Tedesco Triccas, Ben Purplle, Petra. Следует отметить, что Николь Хамметт, получившая приглашение войти в группу Extreme по настоянию своих родителей отказалась от дальнейшего участия, ее заменили Линдси Пач и Марта Микаллеф Аттард. Следующей стадией станет Испытание шести стульев. Финансирование Евровидения 2019 снова стояло под вопросом из-за попыток вмешательства различных израильских политиков. Сегодня правительство Израиля рассматривало вопрос о необходимости сокращения государственного бюджета. Ряд министров высказался против этого, и особенно жестко против намерения выделять из бюджета деньги на финансирование конкурса Евровидение. Так, министр Внутренних Дел Израиля, лидер партии ШАС, Арье Дери заявил: "Я, вместе с министром культуры Мири Регев, министром строительства Ури Ариэлем и другими министрами, выступаю против выделения бюджета Израильской Вещательной Корпорации KAN для производства конкурса Евровидение. Я высказался против, потому что не поддерживаю осквернение шаббата, другие министры высказались против, потому что они полагают, что Корпорация сама должна финансировать производство Евровидения, без использования дополнительного бюджета"
Министр культуры и спорта Мири Регев также воспротивилась финансированию Евровидения из бюджета ее министерства и потребовала, чтобы корпорация сама финансировала это мероприятие из своего бюджета в 800 млн шекелей. "Я буду бороться за это", воскликнула Регев. Ее нынешняя позиция противоречит ее собственным заявлениям, сделанным вскоре после победы. В них, Регев говорила о том, что нужно найти бюджетные источники внутри министерств. Однако, после того, как было решено, что министры не будут иметь права вмешиваться в организационные процессы, Регев начала выступать против бюджетного финансирования конкурса. В конце концов, решение все-таки было принято, потому что оно было проведено одним пакетом, и министры не смогли высказаться непосредственно против финансирования Евровидения. Теперь Вещательная Корпорация должна представить бюджет конкурса (в районе 150 млн шекелей - 35 млн евро) в ЕВС в конце ноября или начале декабря. KAN взял на себя обязательство финансирования 40 млн шекелей от спонсорских доходов и взносов участвующих стран, но оставшиеся 110 млн должны были быть перечислены министерством финансов. В настоящее время, однако, Вещательная Корпорация может использовать бюджет Евровидения только на условиях займа, который должен будет быть возвращен. Министерство связи должно провести поправку к закону об Общественной Вещательной Корпорации, которая бы позволила использовать государственный бюджет при финансировании конкурса Евровидение. Для того, чтобы изменить ситуацию, должно быть собрано заседание Кнессета, где будет принята уже десятая поправка к закону об общественном вещании. Однако, принятие данной поправки весьма маловероятно в нынешнем политическом климате - что может означать еще один серьезный кризис в финансировании конкурса. Как в августе предупредил председатель KAN Гиль Омер, без помощи со стороны правительства, корпорация будет вынуждена отменить проведение конкурса Евровидение, что выльется также в потерю финансовой гарантии в 12 млн Евро, которые корпорация взяла на себя в ущерб бюджета следующего года. Генеральный директор корпорации Эльдад Кобленц рекомендовал менеджменту корпорации не принимать финансирования на подобных условиях. "Корпорация придерживается обязательства защиты государственных средств, инвестируя в израильское творчество, и подобный ответственный подход является краеугольным камнем нового общественного вещания. Не удастся отступить от бюджетных норм, установленных законом. Проведение Евровидения - это вопрос национального интереса, что уже ранее высказывали министры, когда обязались профинансировать данное мероприятие", говорится в новом заявлении KAN.